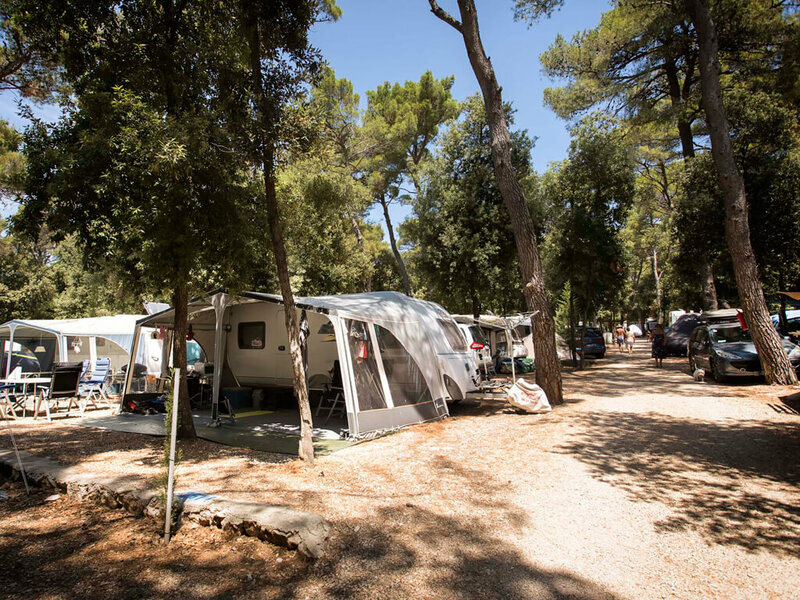 On 20 hectares of dense pine tree forest stretches Campsite Park Soline, a campsite which represents a sanctuary in nature for 3.000 guests. 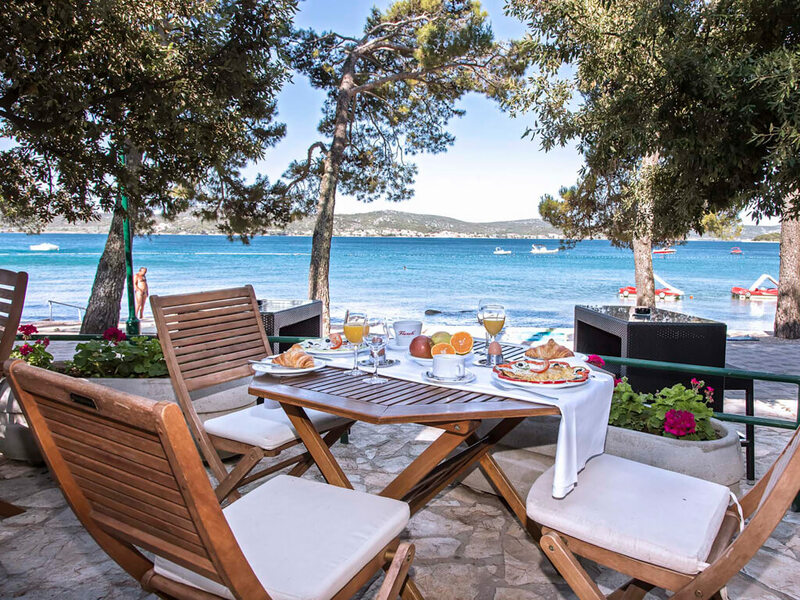 This holiday in nature is provided in the close vicinity of Biograd na Moru, which you can reach by a leisurely walk by the sea. 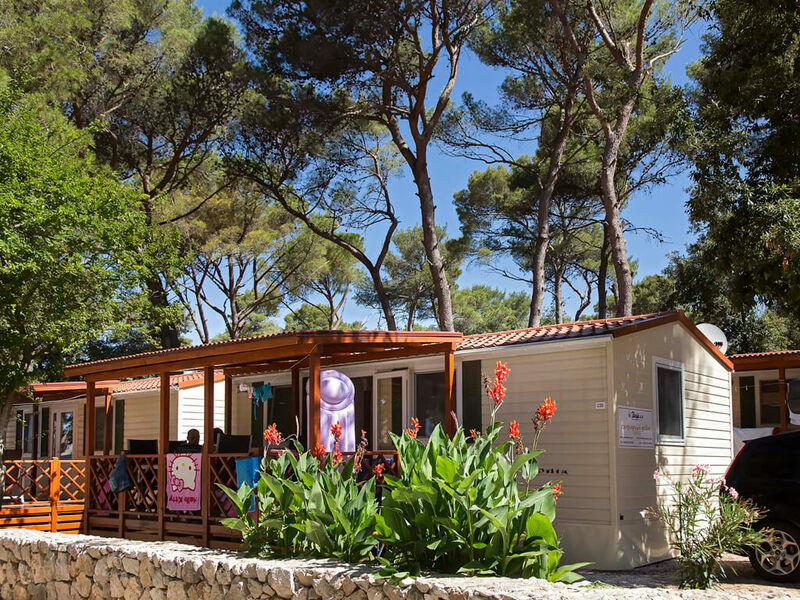 You can choose the location of your own pitch, from among the pitches arranged in a cascading formation throughout the campsite – in the deep shade of pine trees or right on the sea shore. 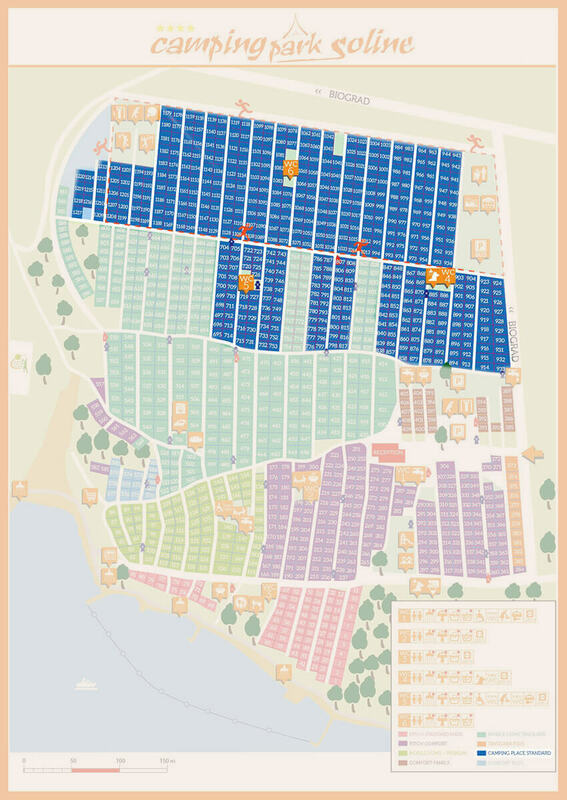 Regardless of where they are situated, as many as 1.000 of them have connection to electricity, while 600 pitches, apart from electricity, also have connections to water and drainage. 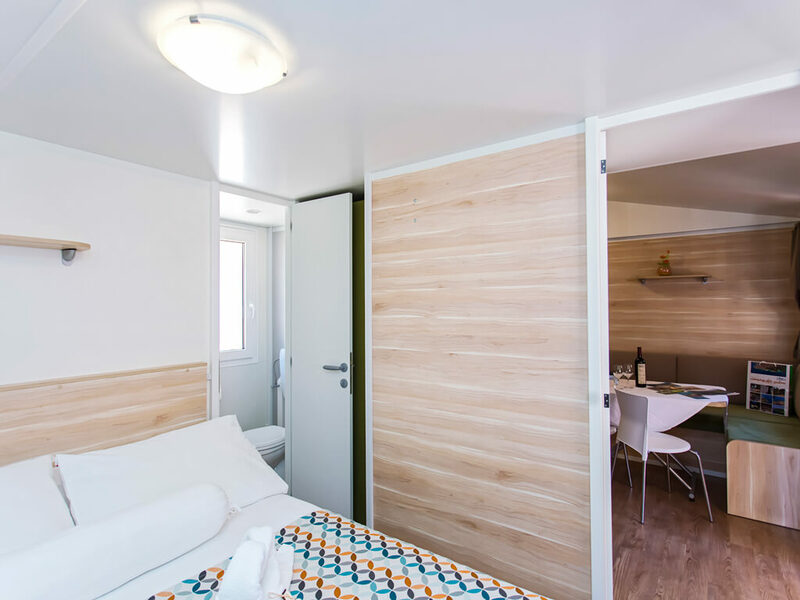 You don’t need to switch yourselves completely off from everyday life – at Campsite Park Soline, you can have the benefits of modern life. 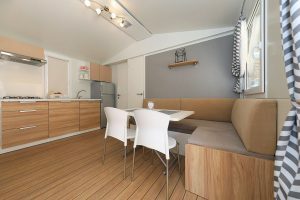 Apart from the basic connections, the pitches also dispose with SAT TV and Wi-Fi. 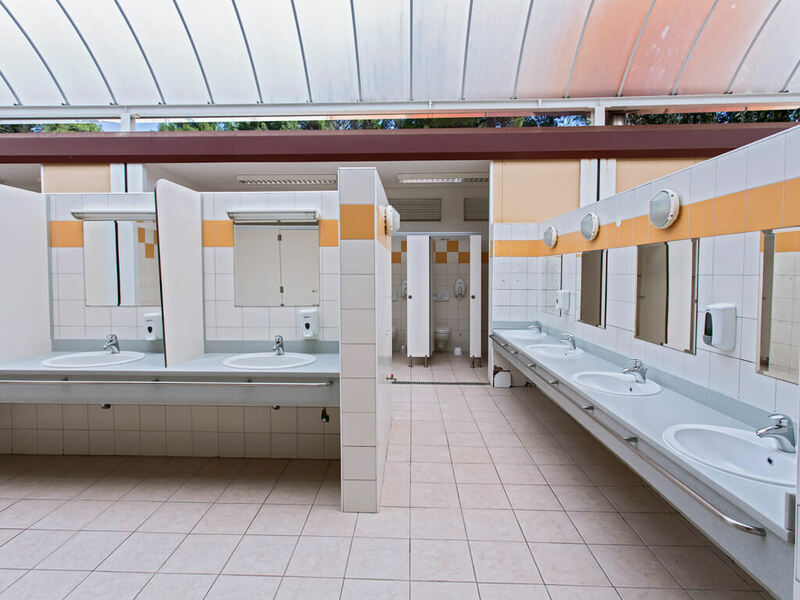 In the close vicinity of the pitches, you will find modern and renovated sanitary points. 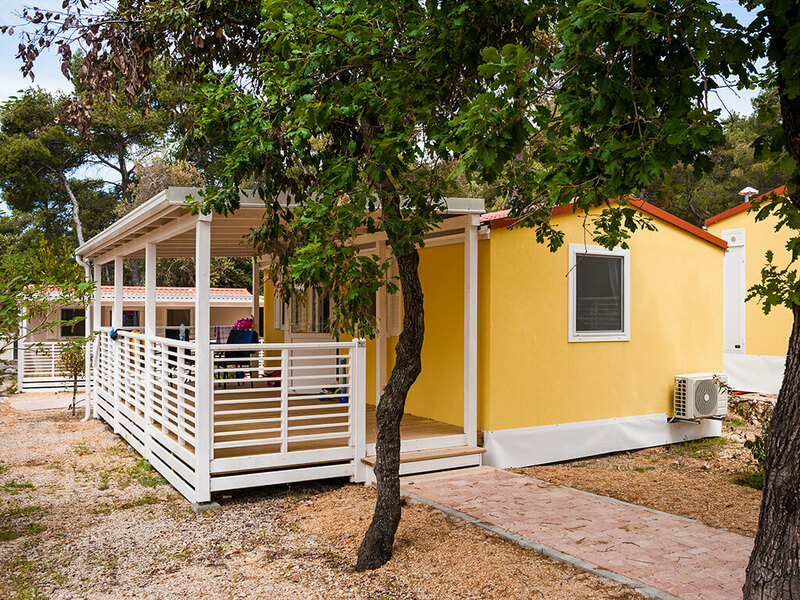 They are equipped with laundry washing and drying machines and fully adapted for persons with disabilities. 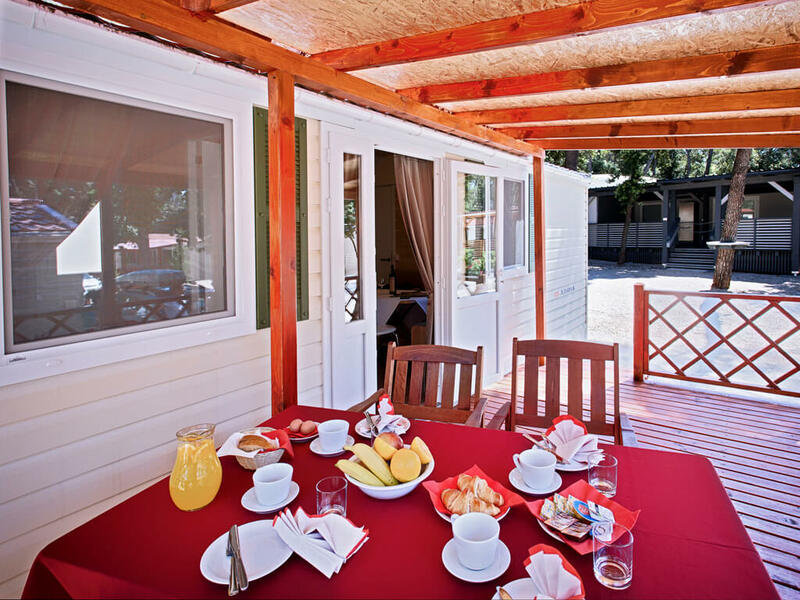 For the feeling of comfort of your own home and during camping, choose mobile homes Tavolara, Premium and Comfort Family. 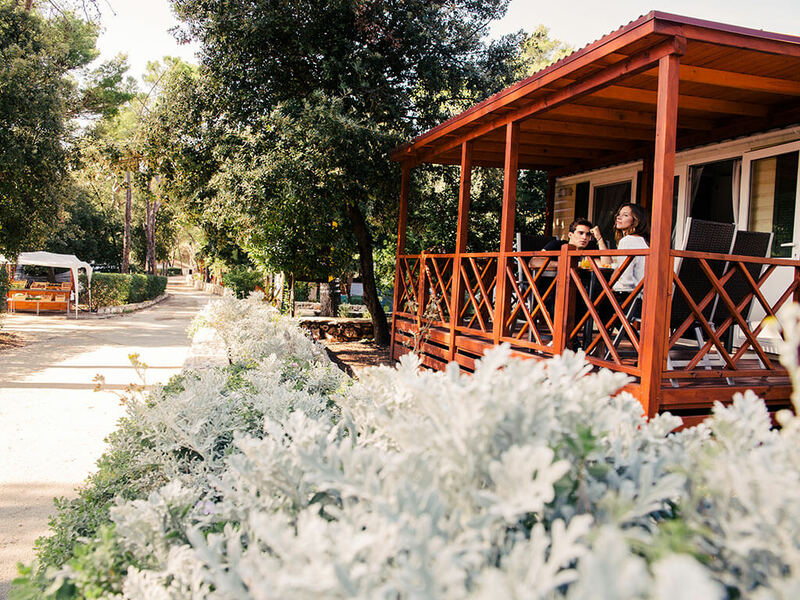 Apart from being fully equipped, from their spacious terraces you will be able to enjoy yourselves in the fragrance of Mediterranean vegetation and a sea view. 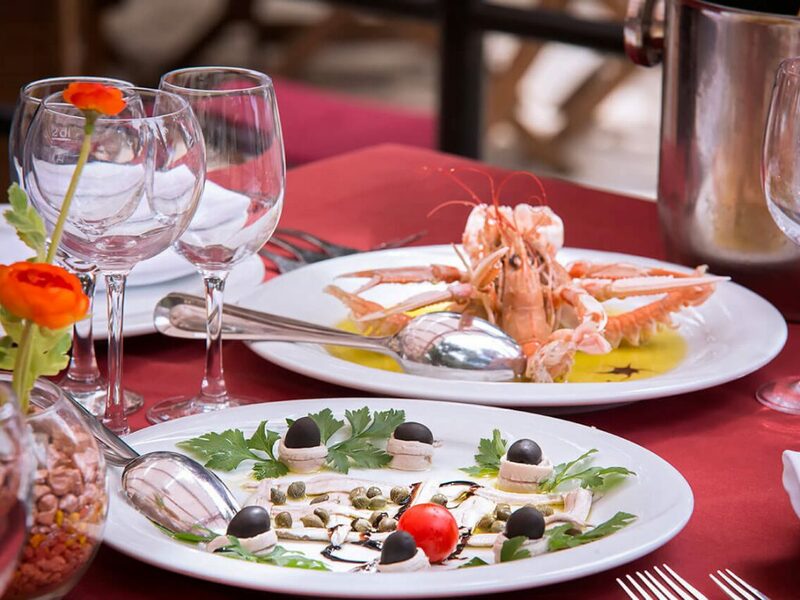 Although based on specialities from the sea, the Mediterranean cuisine is a blend of the sea and the land. 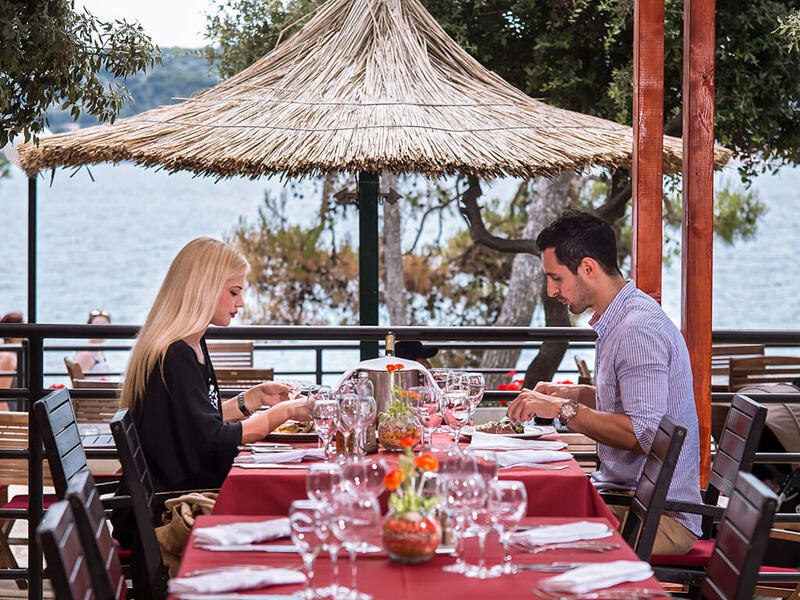 Visit the restaurant Park Soline and taste sea specialities with a unique view of the Pašman canal. 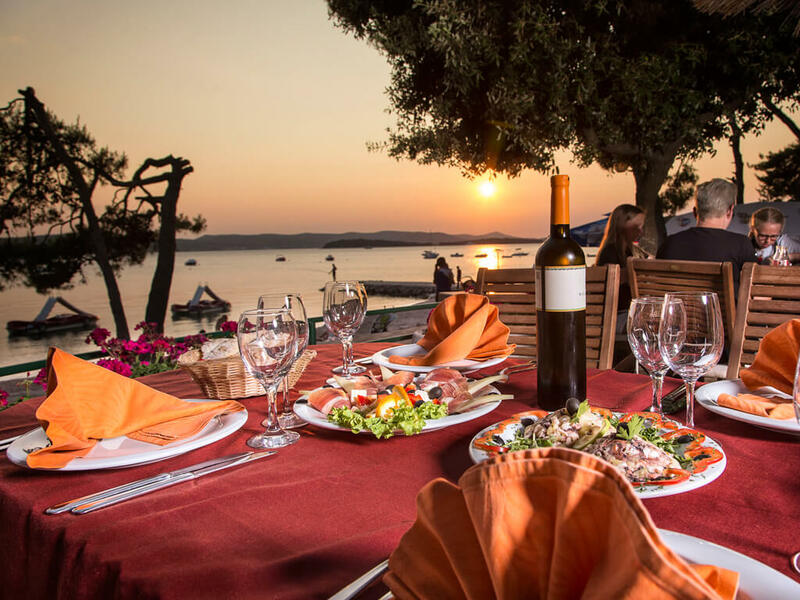 For dinner, choose the same restaurant, but in different surroundings. 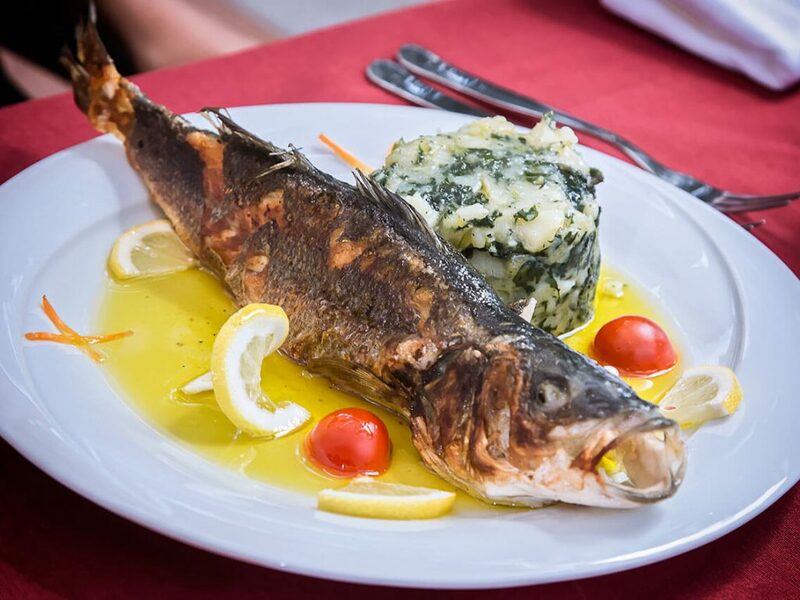 Inside the restaurant, there is a Dalmatian tavern – konoba with a fireplace – an atmosphere ideal for tasting the Dalmatian hinterland. 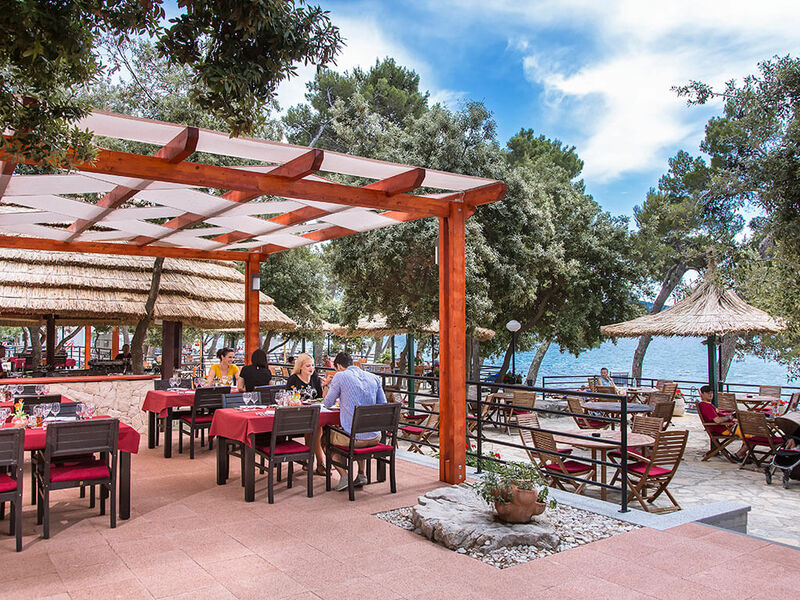 Relax at the Lavender bed bar, the first bed bar in Croatia, ideal for long afternoon relaxation with refreshing drinks and good music. 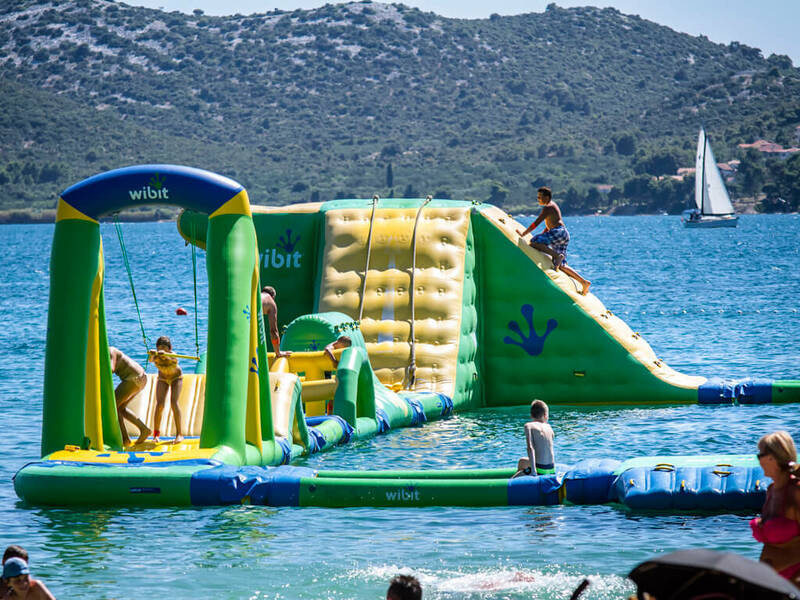 Summer is a time of year when all the events and fun move to the sea and the beach! 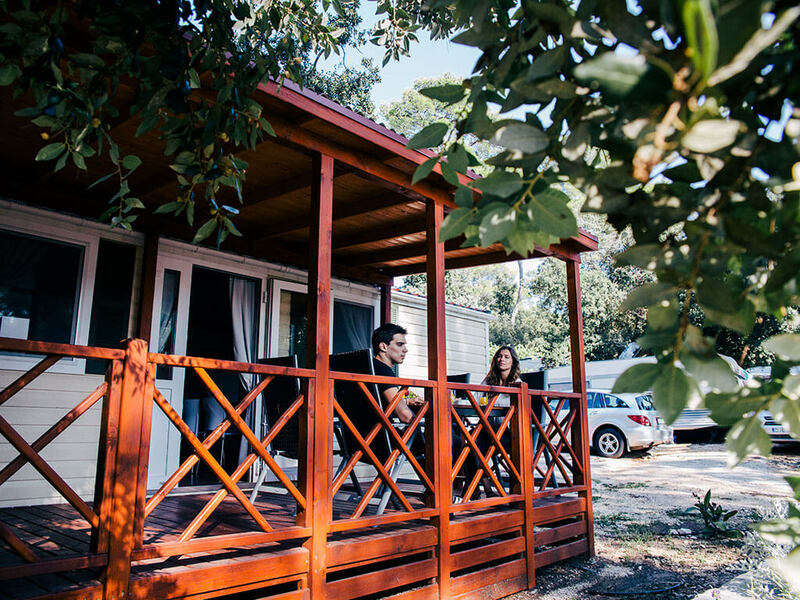 A long pebble beach, with which the campsite is crowned, will become your new sitting room where, apart from relaxation, there will be no shortage of fun for the youngsters either. 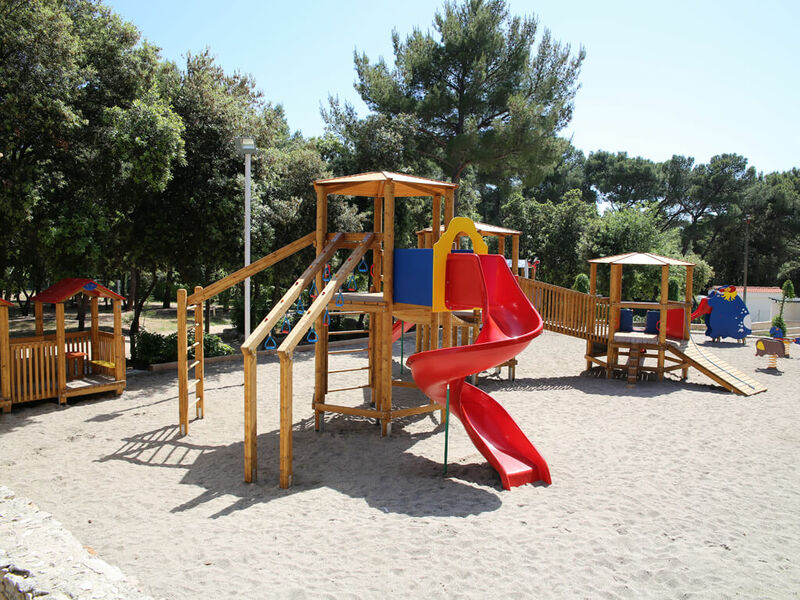 A leisurely walk away from Campsite Park Soline, the sandy beach Soline is an ideal choice for families with children – the building of sand castles will be a real challenge for them! Supplement your holiday days with various animation programmes for children and adults! Join the animation programme and discover your creative side. 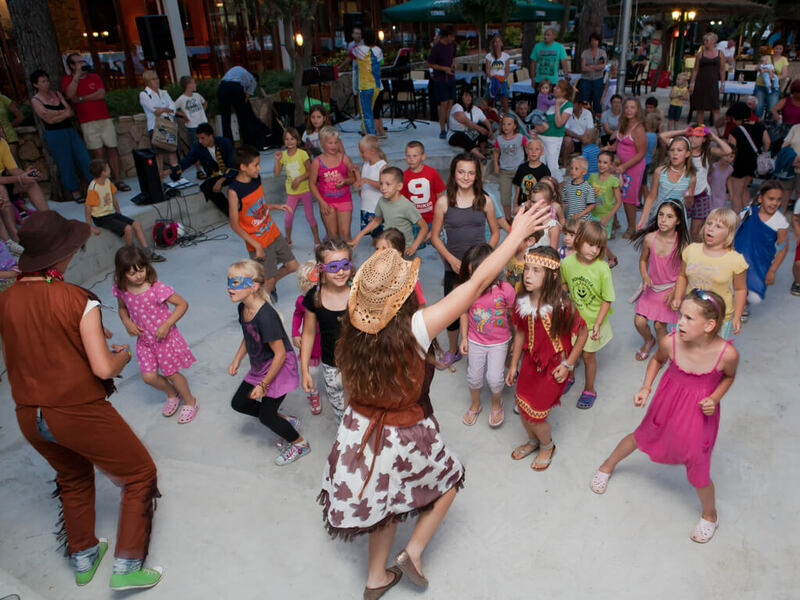 There is also a programme for the youngsters – play, dance and sport! 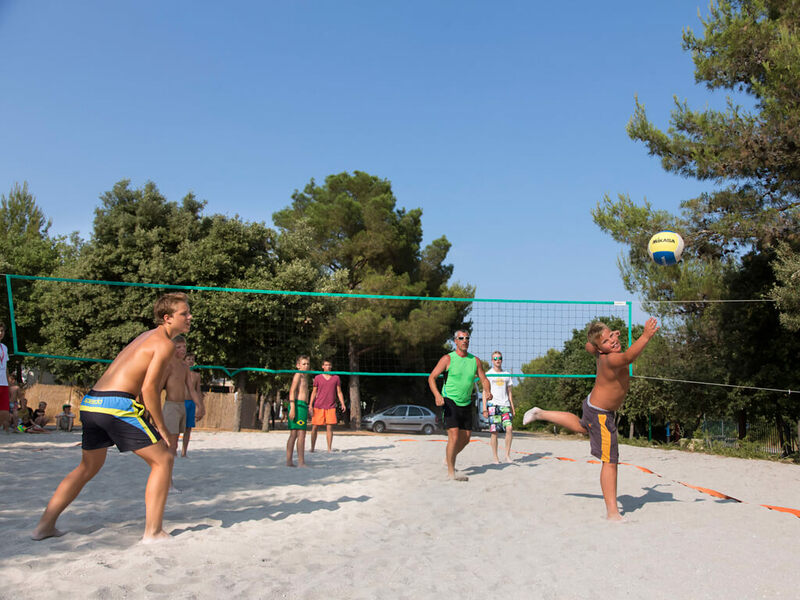 Swap the volleyball for a football and have a go at beach football. 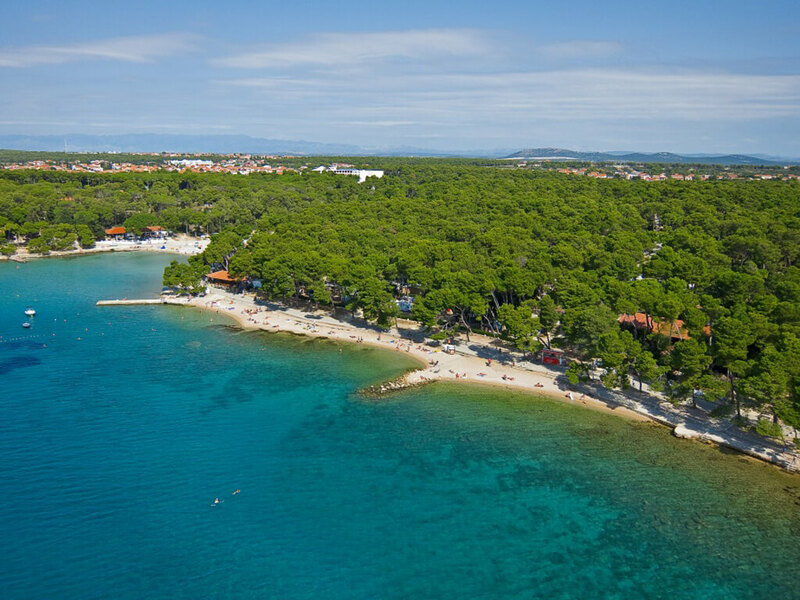 Should you go for the morning jogging or a walk, let it be the promenade to the town of Biograd – for a perfect start to your day! 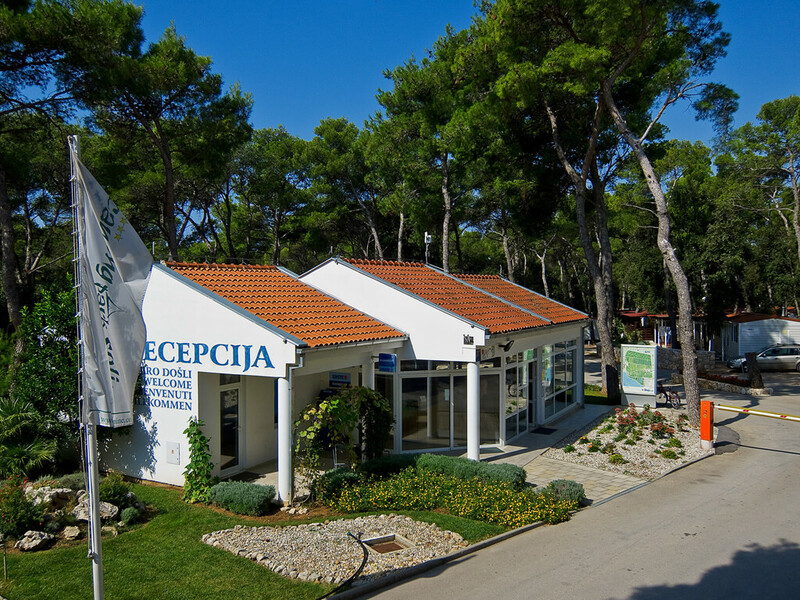 The doctor’s surgery is situated in the town of Biograd, which is 2 km away from the campsite. 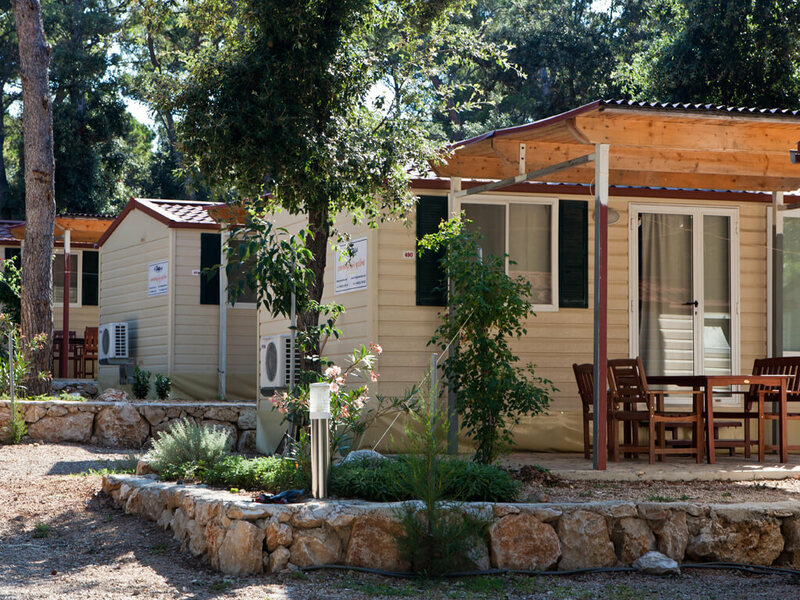 The campsite is partly adapted for disabled persons. 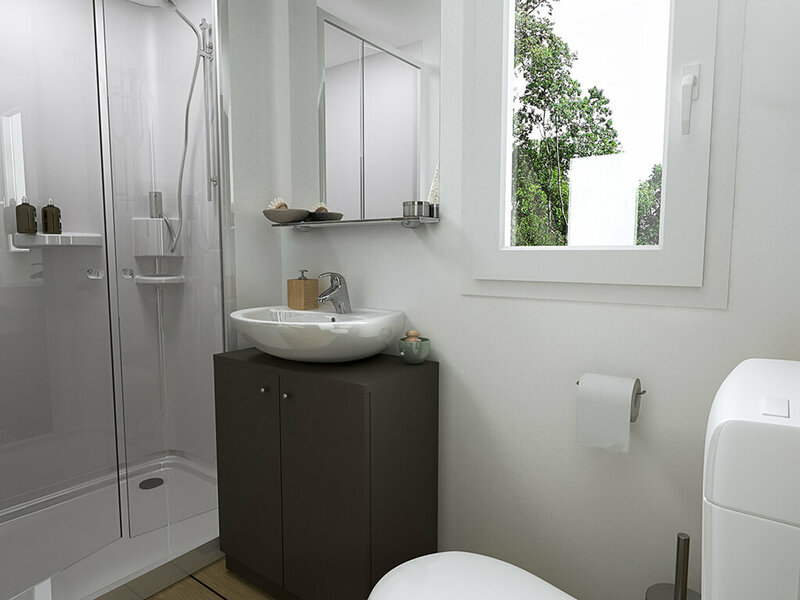 It has sanitary points which are adapted for disabled persons. Sea entrances are not adapted for disabled persons. 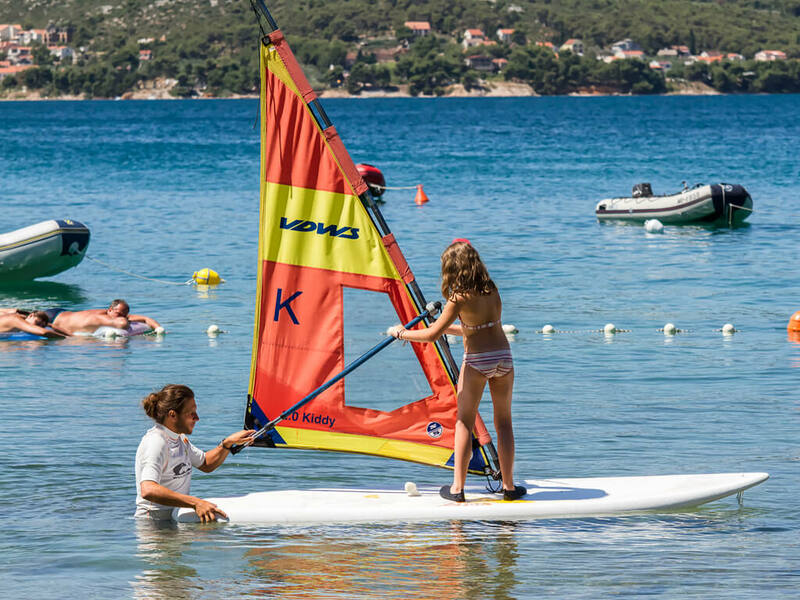 Campsite Park Soline provides animation activities for its guests: sports activities and tournaments, schools of dance, sailing, mini club, themed entertainment and evening programmes. Animation is free of charge. 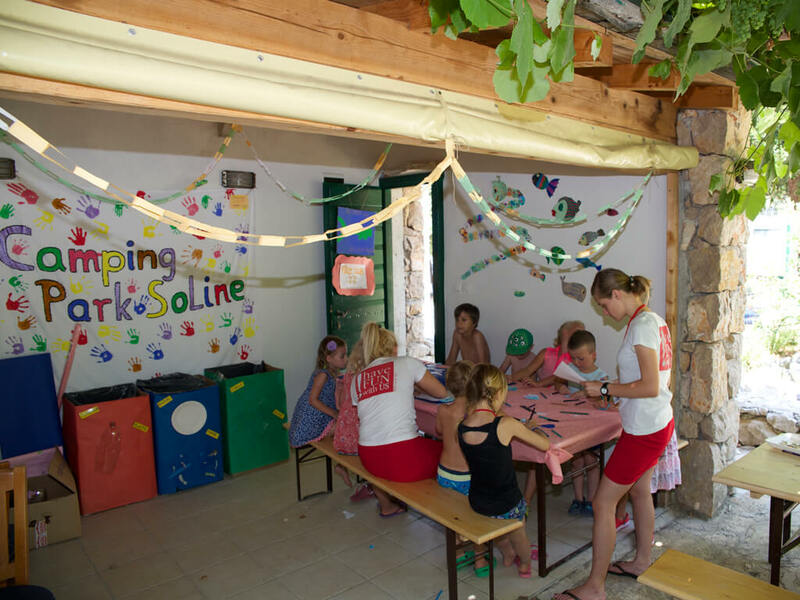 Does campsite Park Soline have Wi-Fi? 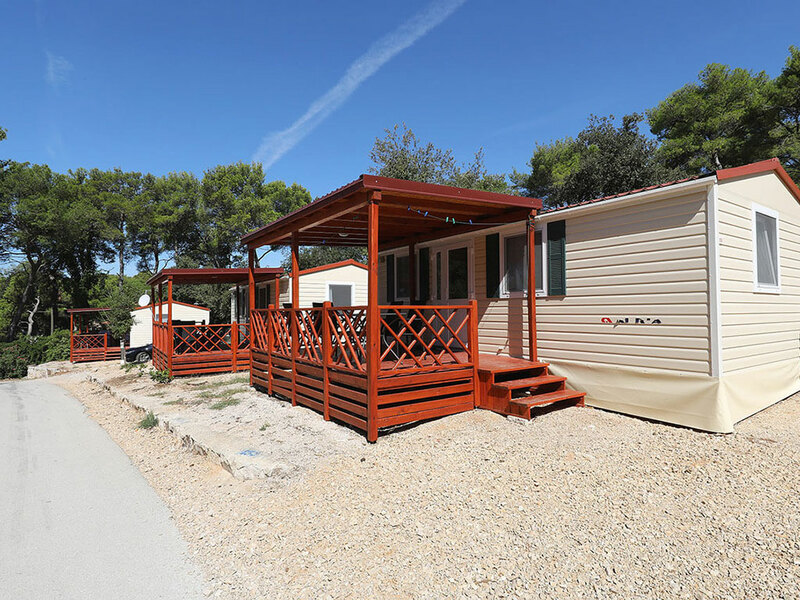 Campsite Park Soline is fully covered with free Wi-Fi. 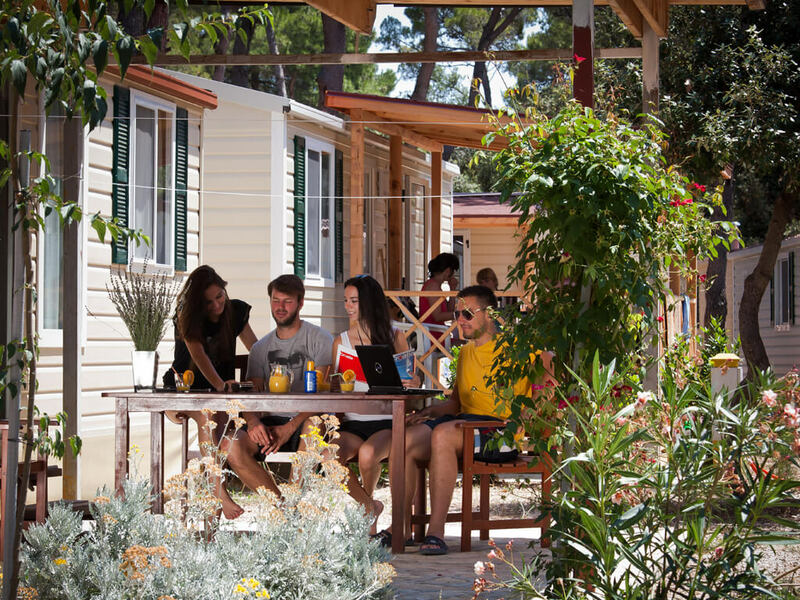 All campsite accommodation units have free connections to Wi-Fi. Apart from this, guests also have at their disposal the Internet corner at the campsite reception. 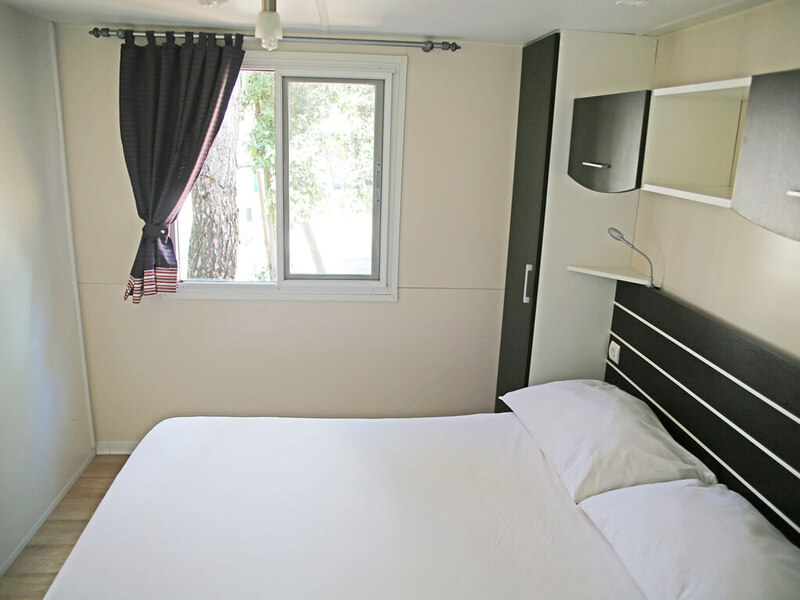 There is no possibility to rent a fridge at the campsite Park Soline. There is no car wash at the campsite Park Soline. 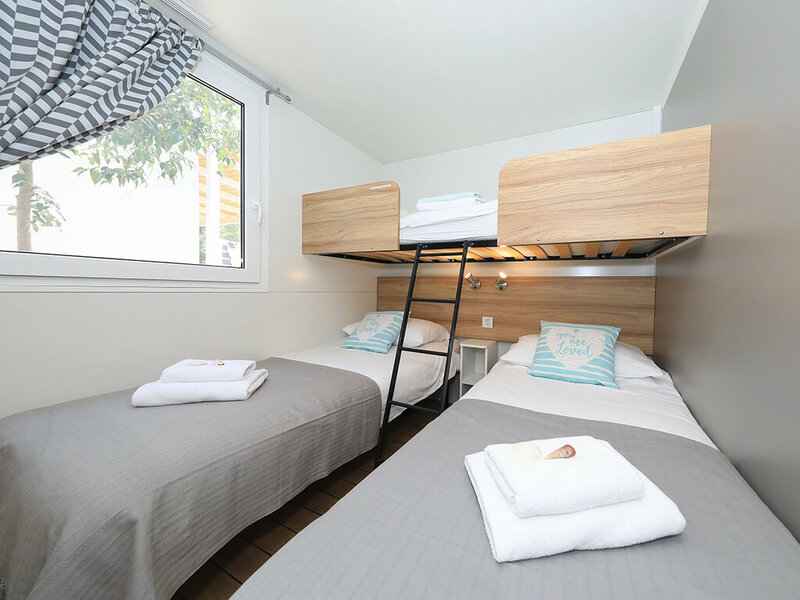 If you wish to stay in your own tent, camper van or caravan, at campsite Park Soline you will find different types of pitches – Comfort and Standard. 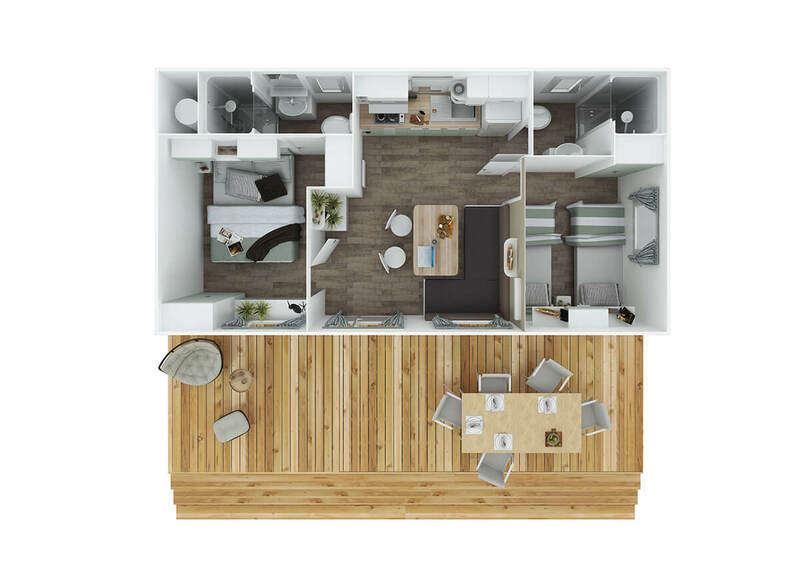 Comfort pitches have standard connections to electricity and water and drainage, while the Standard pitches have a standard connection to electricity. 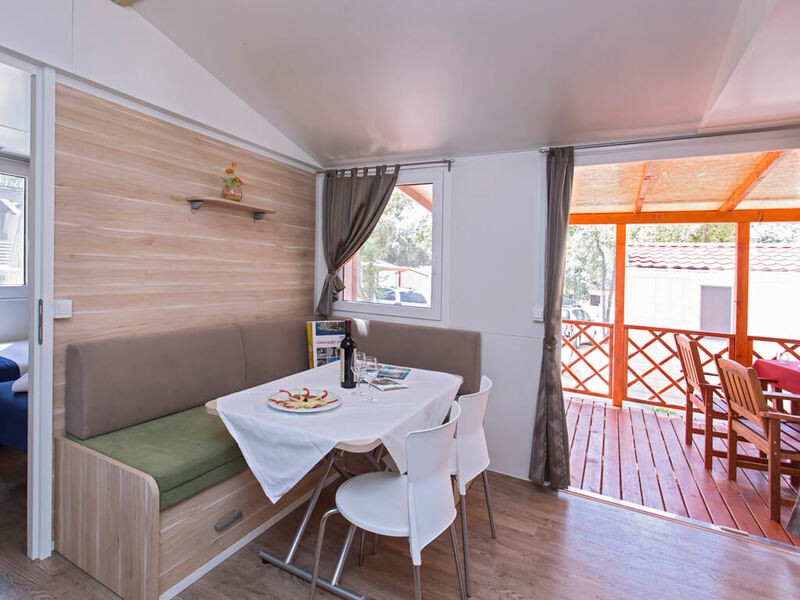 If you like staying in nature and do not have your own caravan – our recommendation would be accommodation in campsite Park Soline mobile homes Tavolara, Premium or Comfort Family. 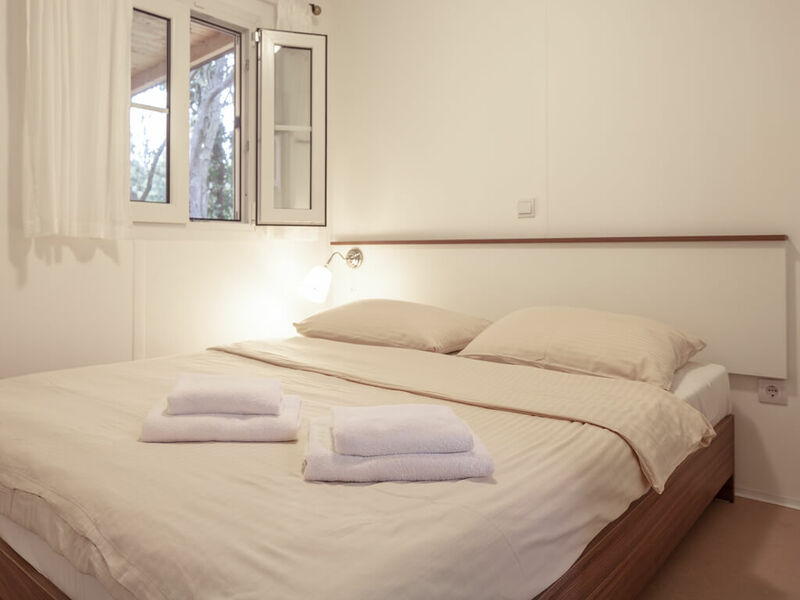 It is not possible for us to book adjoining pitches. 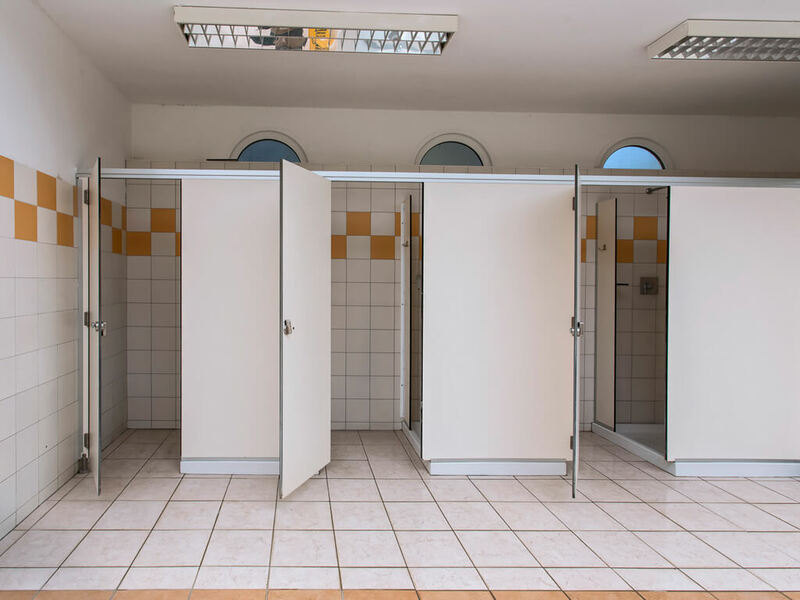 We will note your preference for the vicinity of pitches upon booking in order for your wish to be taken into consideration, subject to availability. 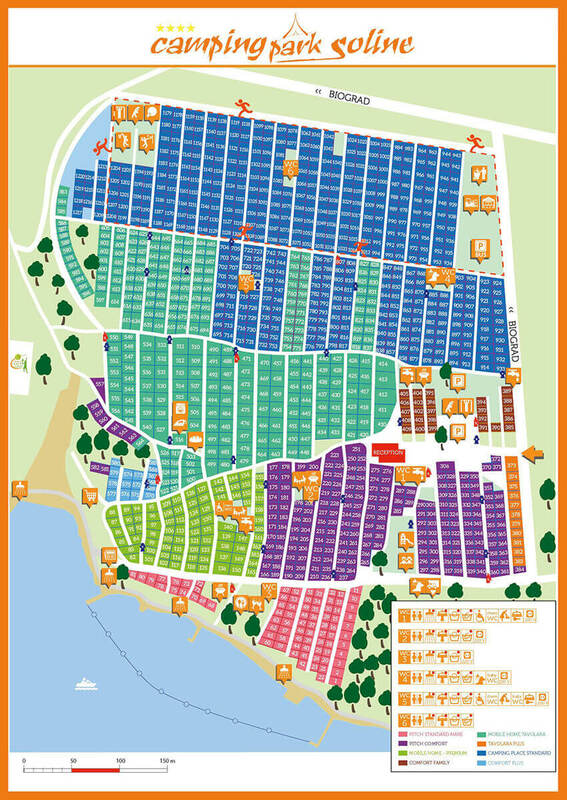 On your arrival at the campsite, you will be given the number of the pitch where you will be accommodated at the campsite reception. 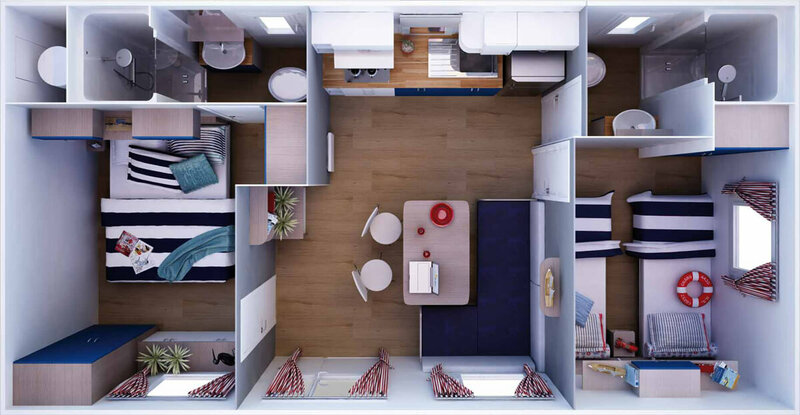 The same terms apply to mobile homes. 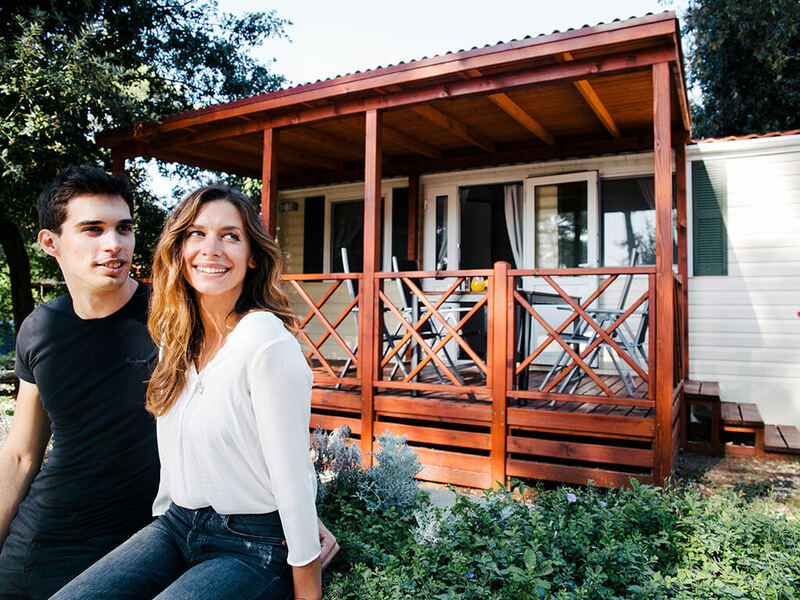 Can I book a specific pitch or mobile home number? 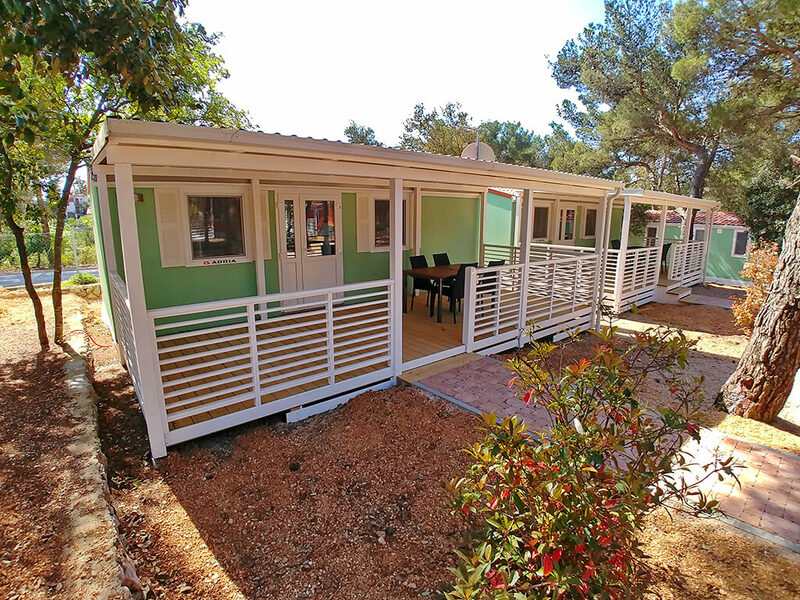 It is not possible for us to book the preferred pitch or mobile home number. We will, however, note your preference upon booking in order for your wish to be taken into consideration, subject to availability. 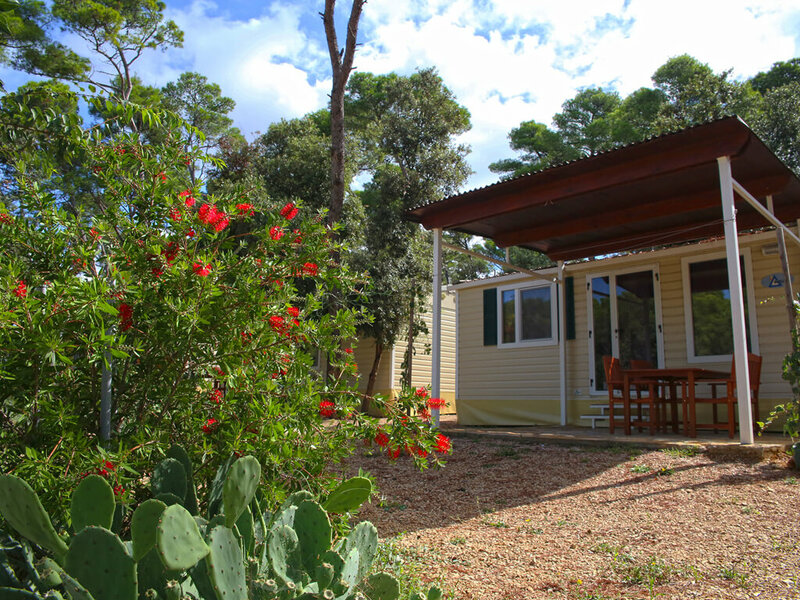 On your arrival at the campsite, you will be allocated a pitch or mobile home number at reception. 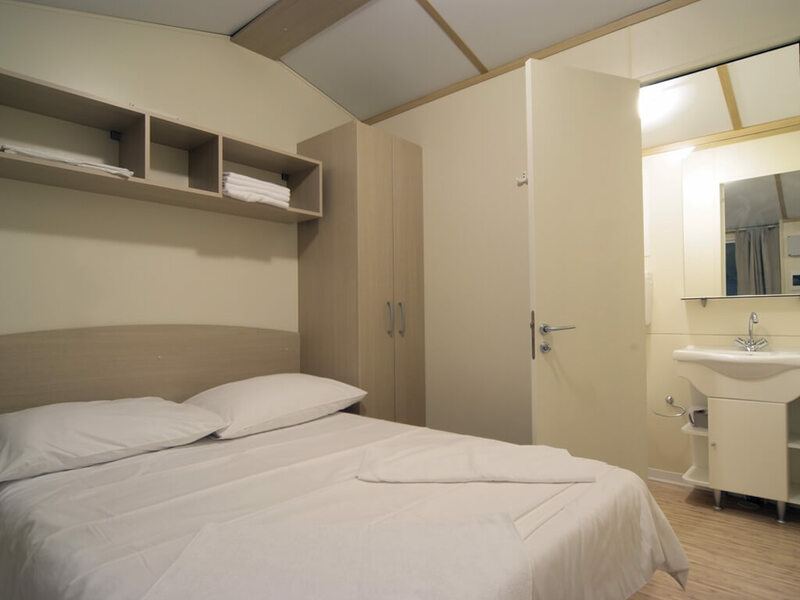 Is it necessary to book accommodation at campsite Park Soline? 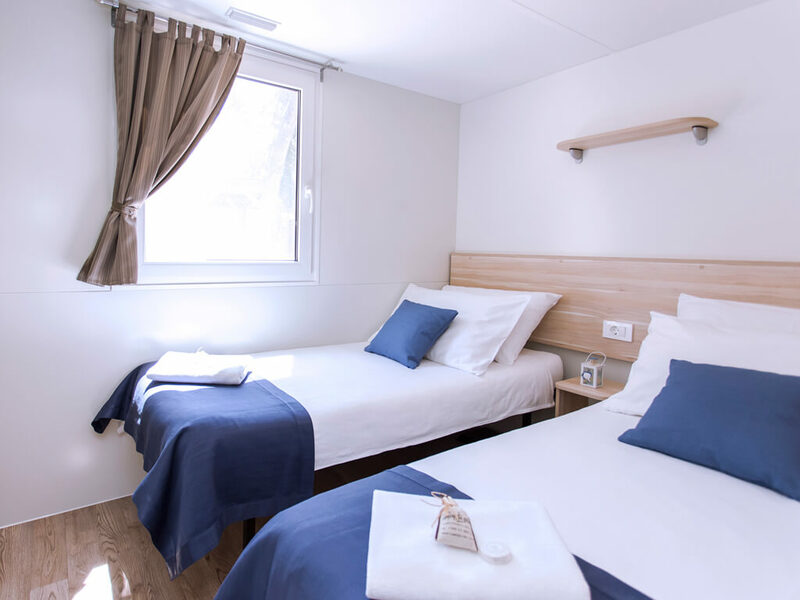 At campsite Park Soline you can also stay without prior booking, but we would certainly recommend accommodation booking for two reasons: the price is more favourable if you book your preferred accommodation in advance, compared to the price on arrival. 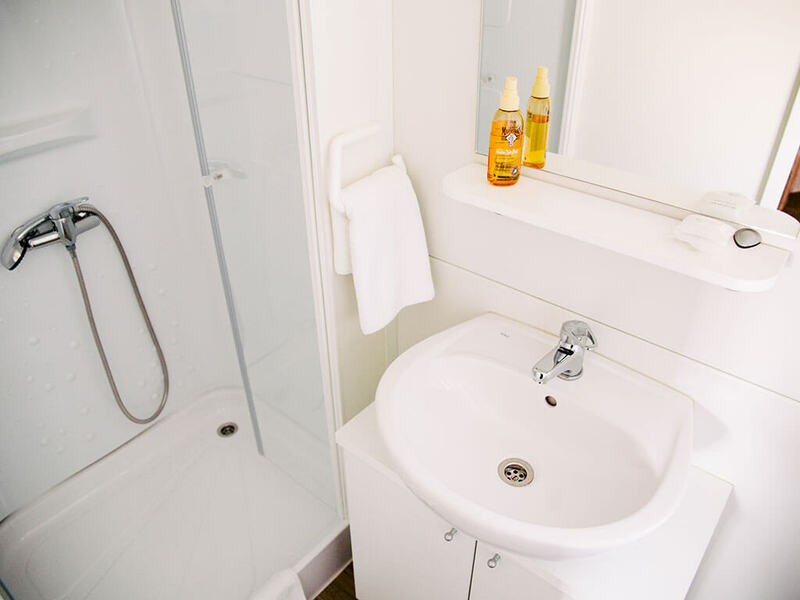 Also, in this way you are avoiding the risk of being left without accommodation at the campsite. 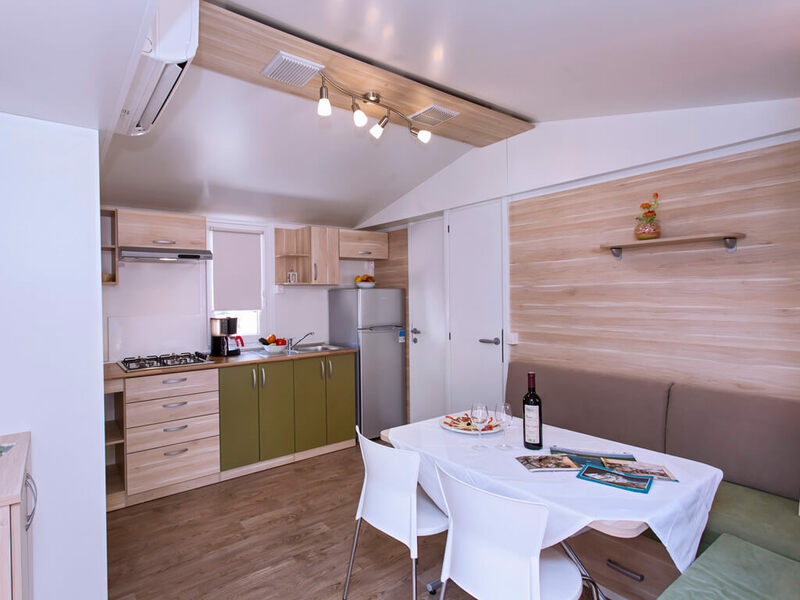 The sojourn tax is not included in the pitch and mobile home booking price. 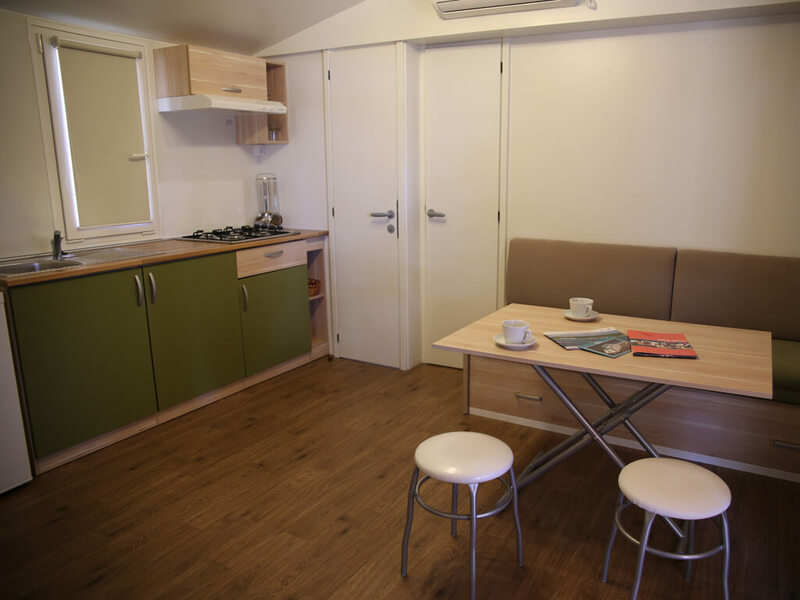 The sojourn tax is payable at reception (for pitches and mobile homes). In summer time the reception is open from 7:30 a.m. to 9:30 p.m. 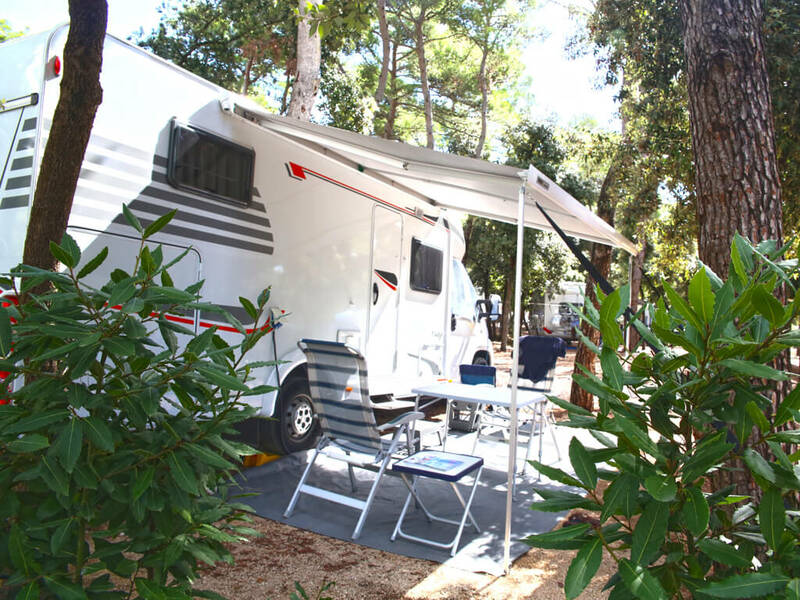 The campsite Park Soline accepts American Express, Diners Club, Eurocard - Master Card and Visa credit cards. Payment is also possible with cash dispenser cards and in cash. 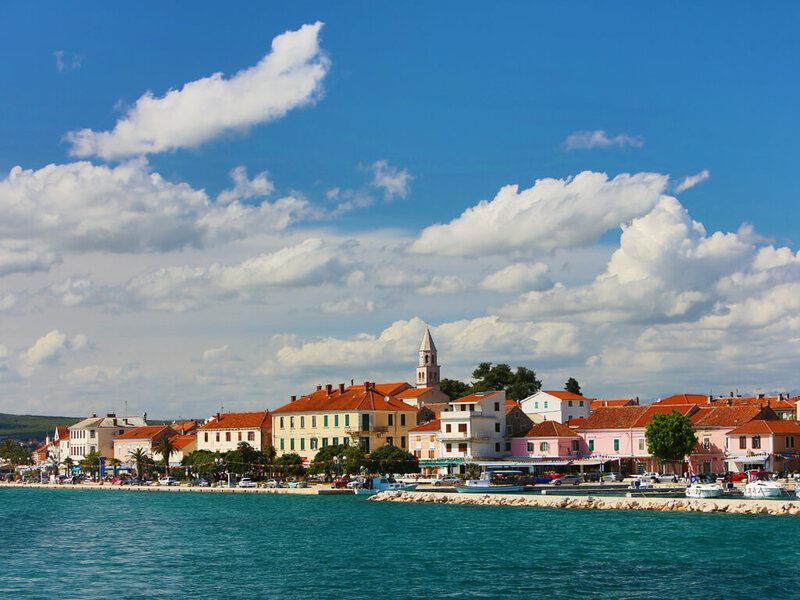 Payment by credit card is charged in Croatian kuna (HRK). Your bank charges the amount converted into the national currency of your account. As a result of the conversion, there is a possibility of difference between the amount withdrawn from your account and the amount on the campsite bill in Croatian kuna (HRK). 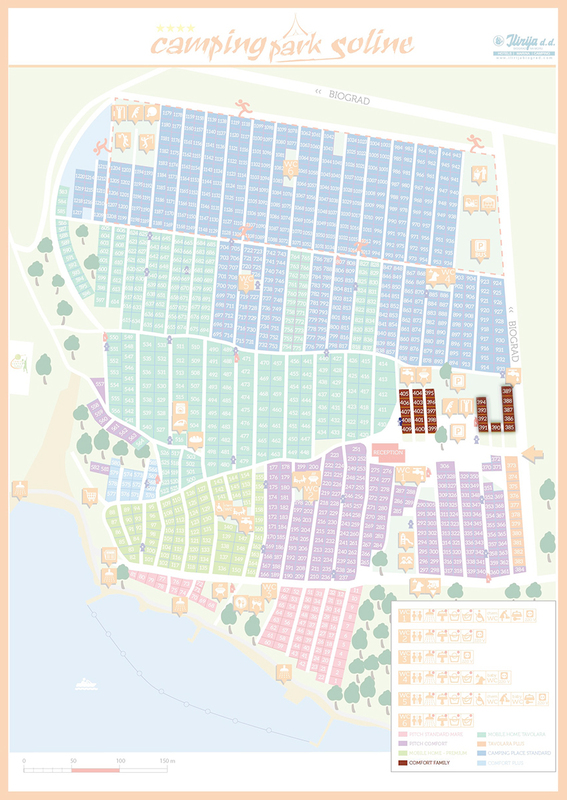 What camping cards does campsite Park Soline accept? 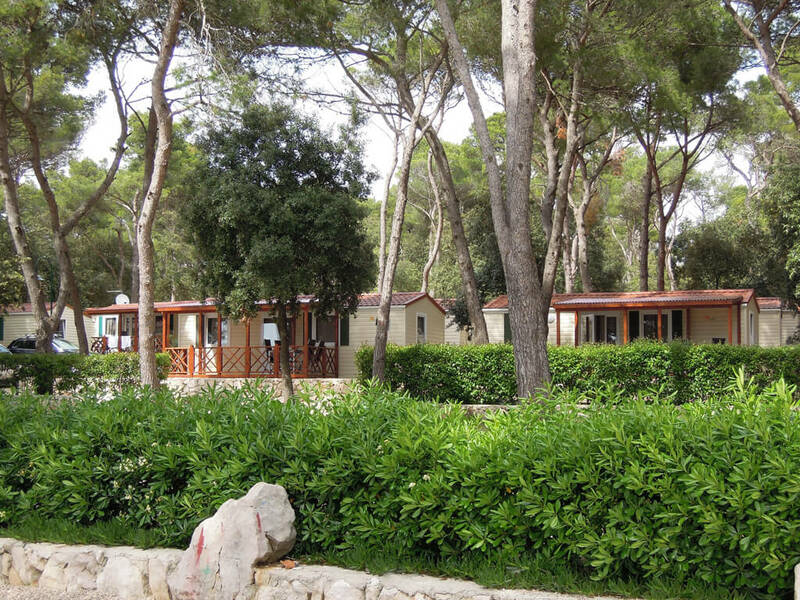 Campsite Park Soline accepts CCI cards in order for you to benefit from additional discounts, directly at reception. 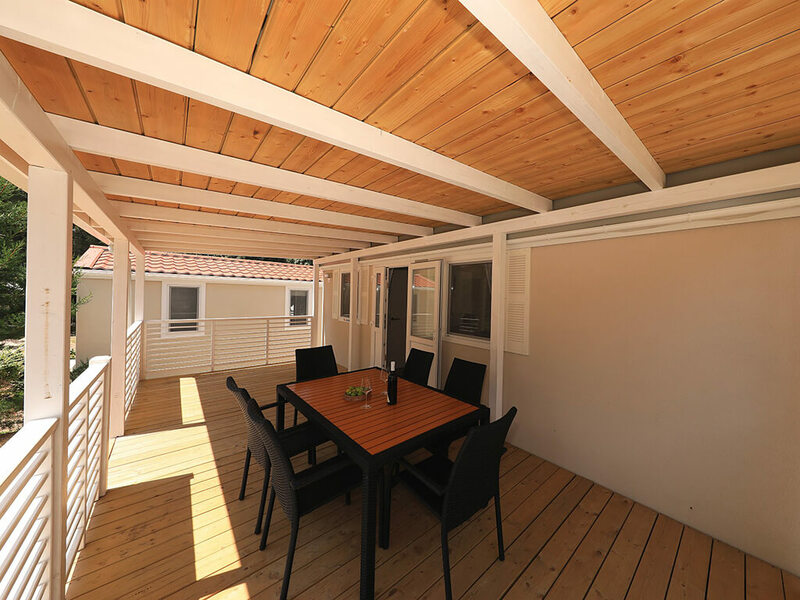 Discounts are valid in April, May, June, September and October. 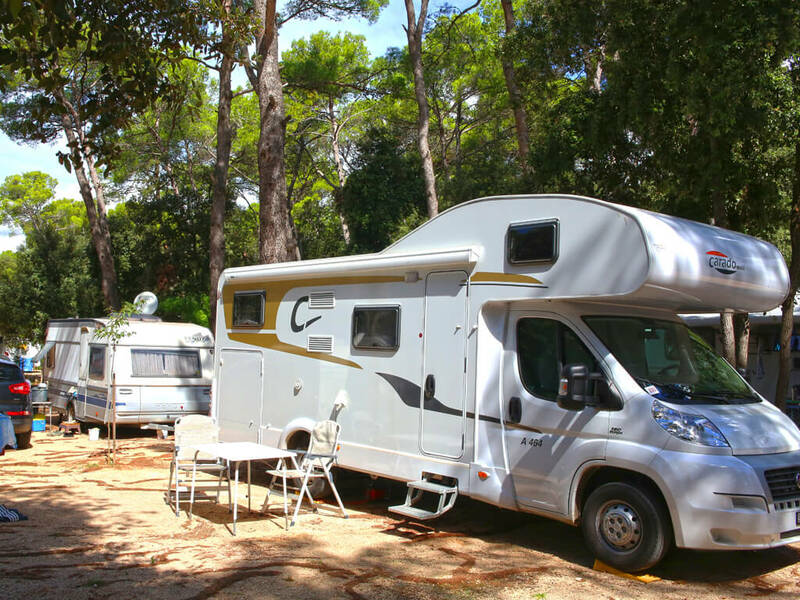 We have booked a pitch at campsite Park Soline. 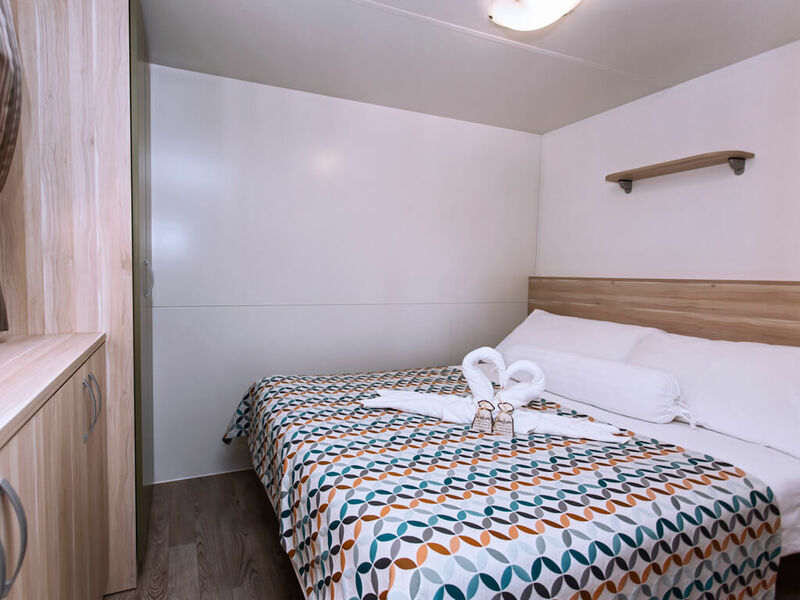 What are the check-in and check-out times? 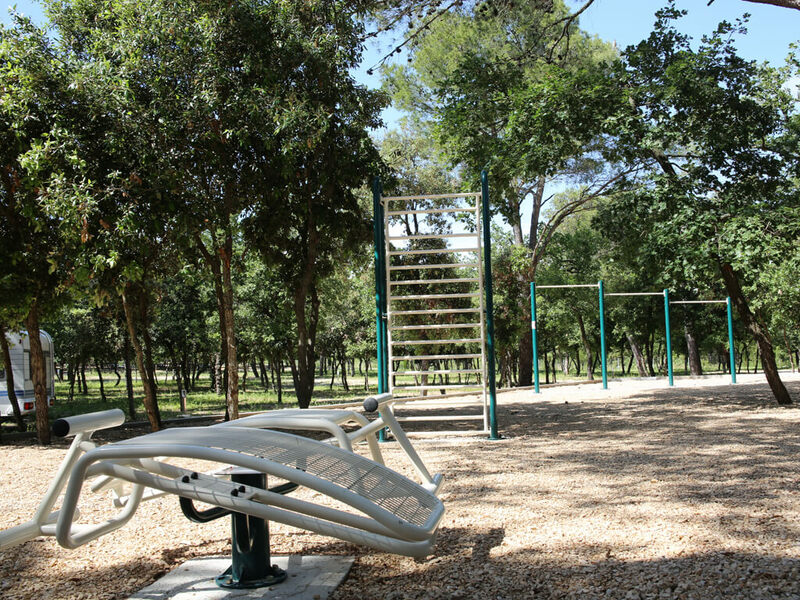 At campsite Park Soline, check-in is from 2 p.m. and check-out by noon. 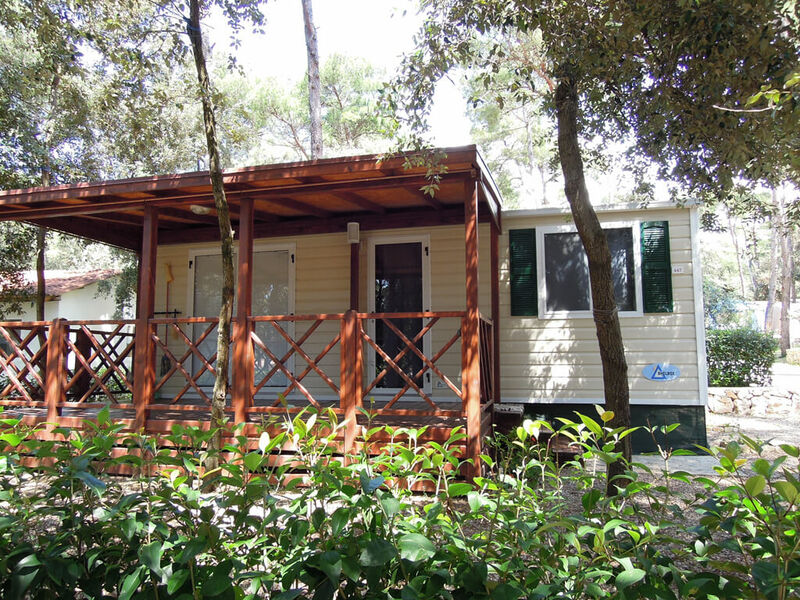 We have booked a mobile home at campsite Park Soline. What are the check-in and check-out times? 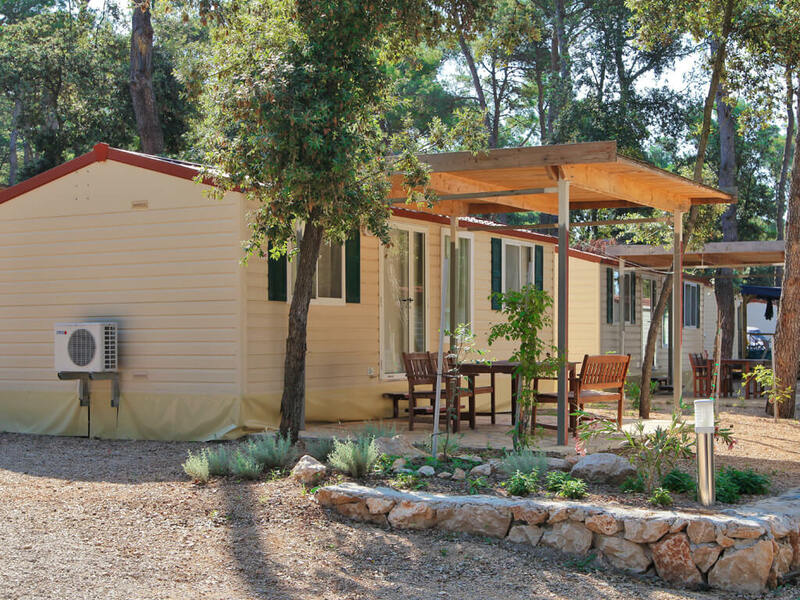 For mobile homes, at campsite Park Soline, check-in is from 3 p.m. and check-out by 10 a.m.
Should you not like your pitch or the mobile home, please contact the campsite reception. 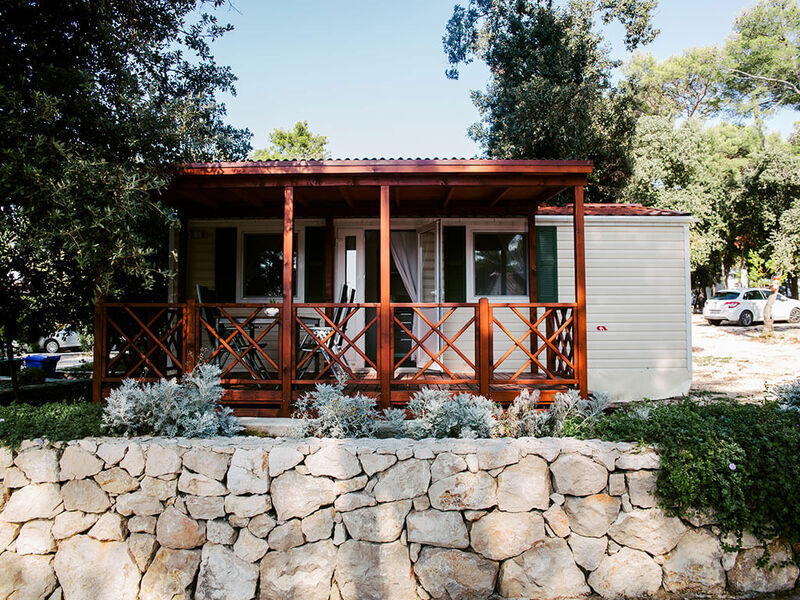 Depending on availability at the campsite, reception will do their best to find a pitch or a mobile home with which you will be happy, making sure that you get the pitch or mobile home category you booked. 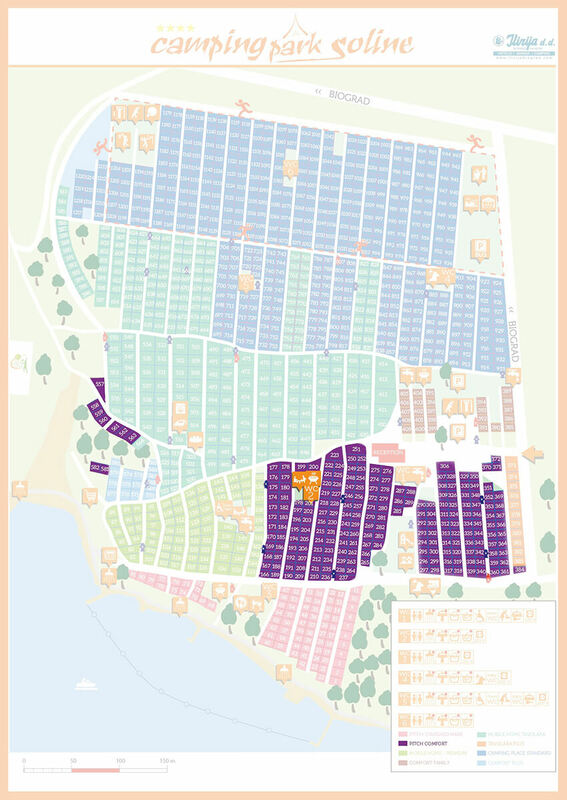 Are the campsite Park Soline pitches located in the shade? 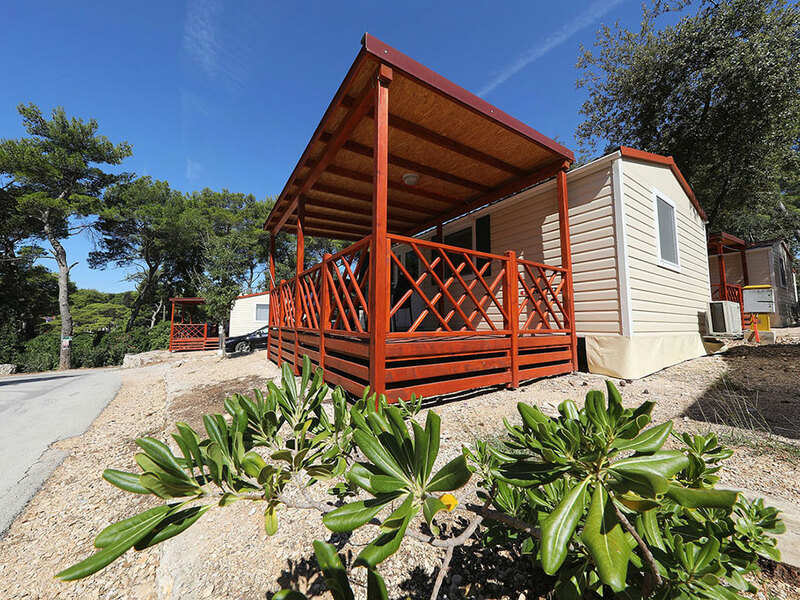 Most of the Standard and Comfort pitches of campsite Park Soline are located in pine woods. It is not possible for us to book or guarantee pitches in the shade. 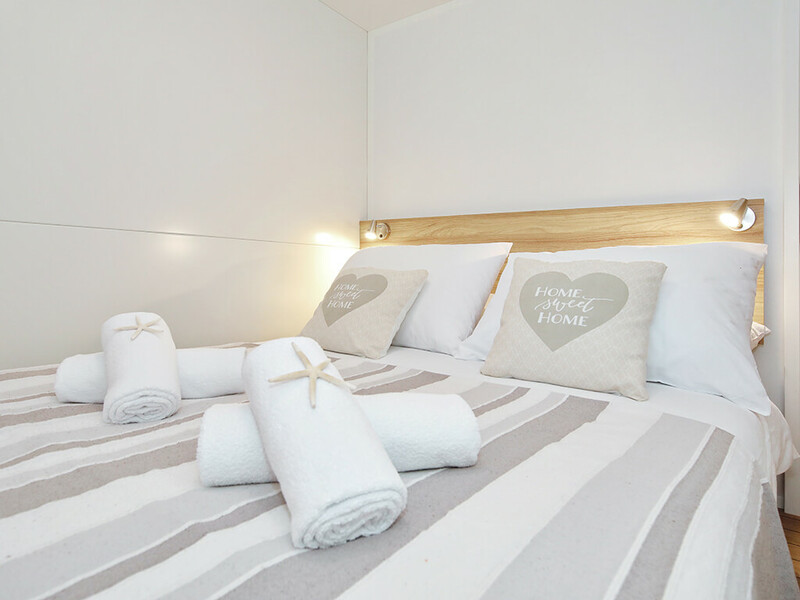 We will be happy to note your preference for a particular pitch upon booking in order for your wish to be taken into consideration, subject to availability. 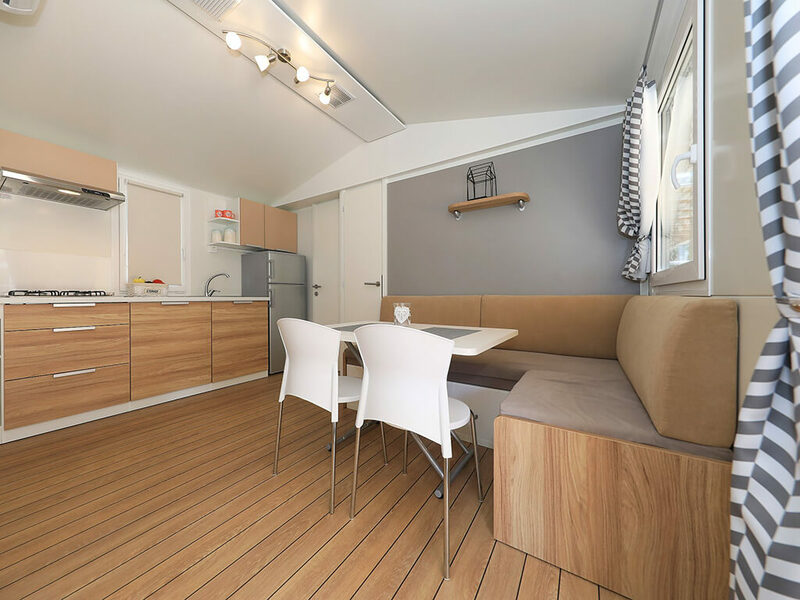 The final cleaning in campsite Park Soline mobile homes is € 35. 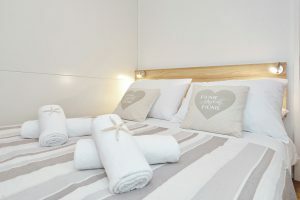 Bed linen and towels are included in the mobile home rental price. 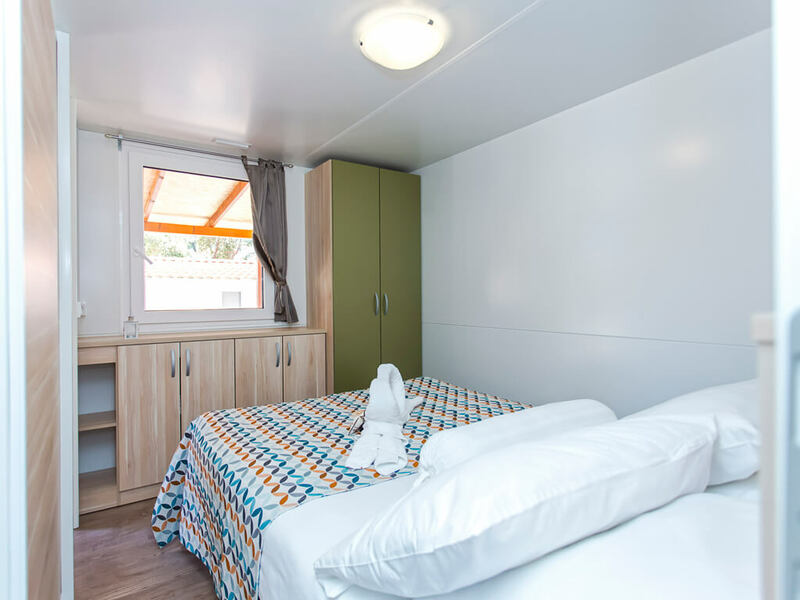 At the campsite Park Soline mobile homes, bed linen is changed every 7 days and towels 2 times a week. 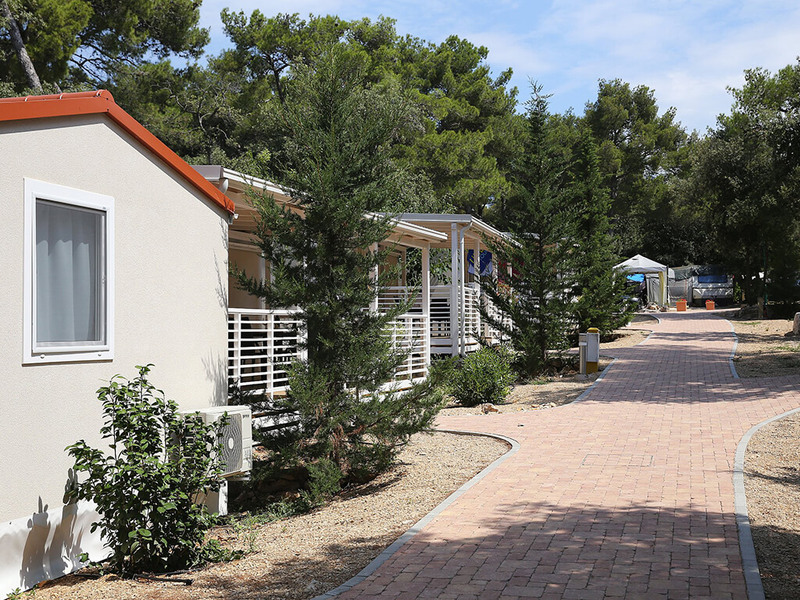 Pets are allowed in all mobile homes of campsite Park Soline. 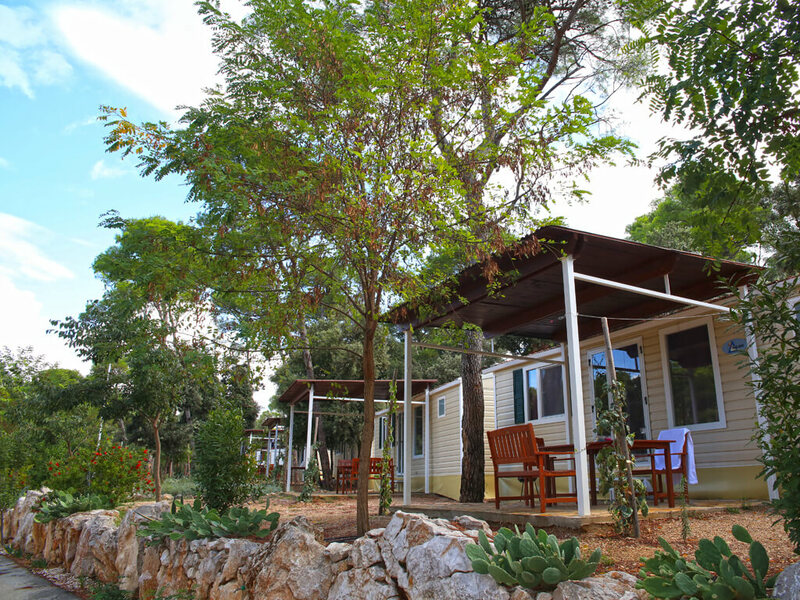 For Tavolara and Premium mobile homes guests, parking is provided right by the mobile homes. 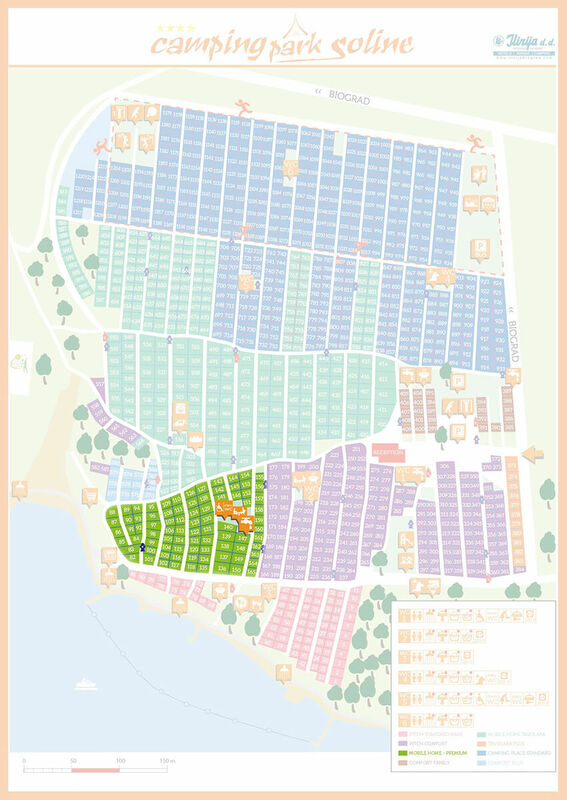 For mobile homes Comfort Family there are numbered parking spaces outside the mobile homes zone. 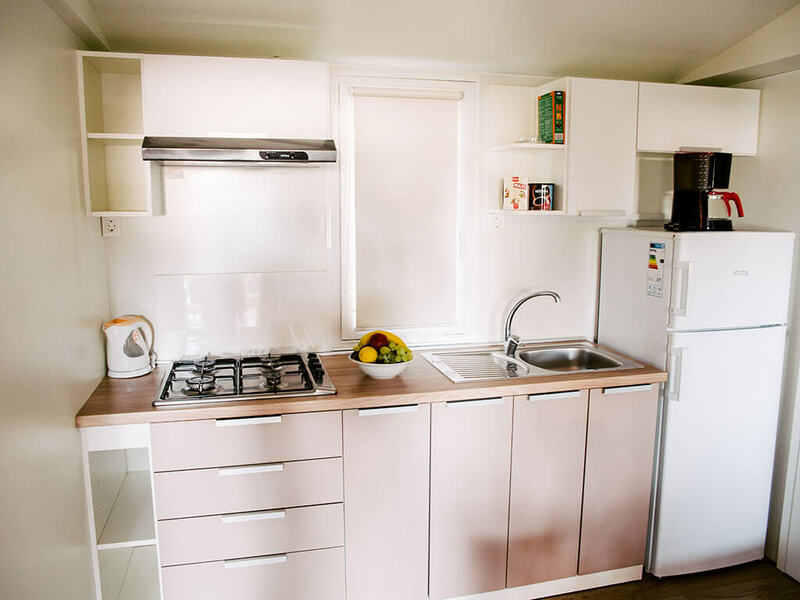 The campsite Park Soline mobile homes are equipped with dishes, SAT TVs, refrigerators, cookers and coffee machines. 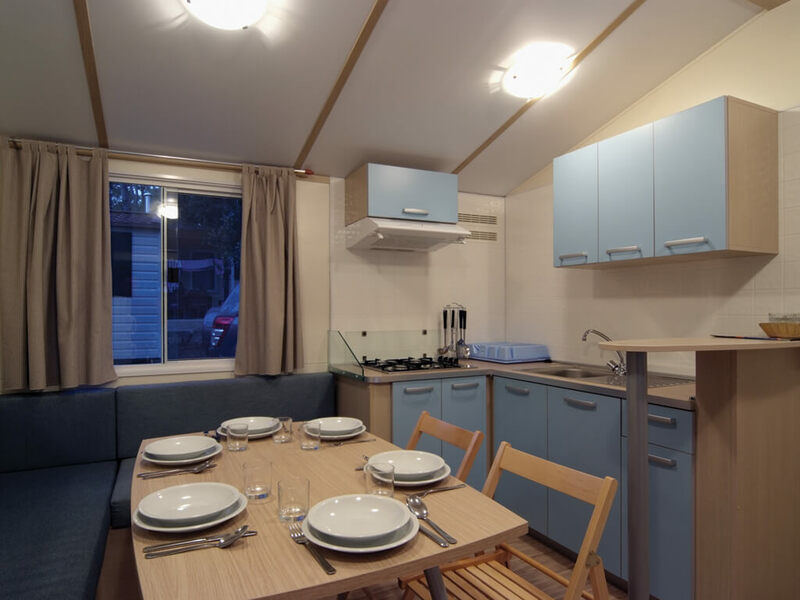 All mobile homes are air conditioned. 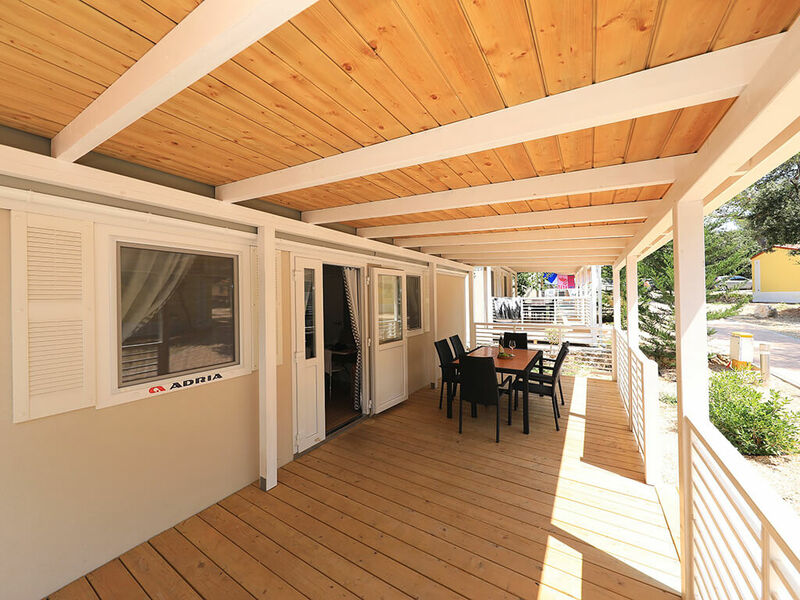 All mobile homes have a safe inside the mobile home. 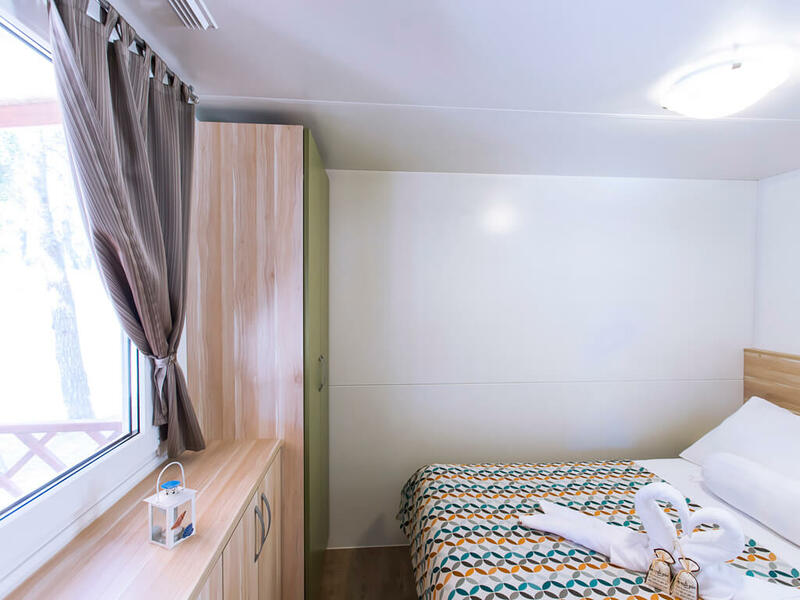 In all mobile homes at campsite Park Soline there is a possibility to use a baby cot without any additional charges. 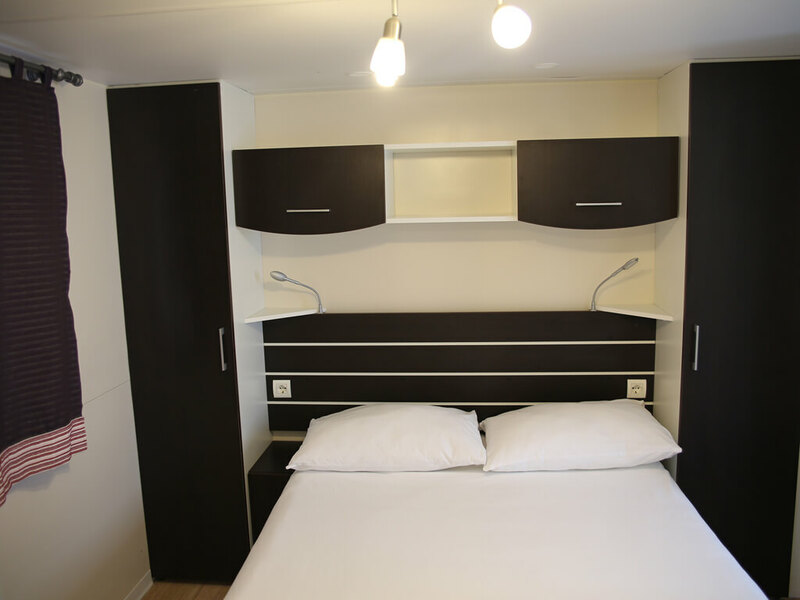 You have the possibility of doing your laundry at campsite Park Soline. 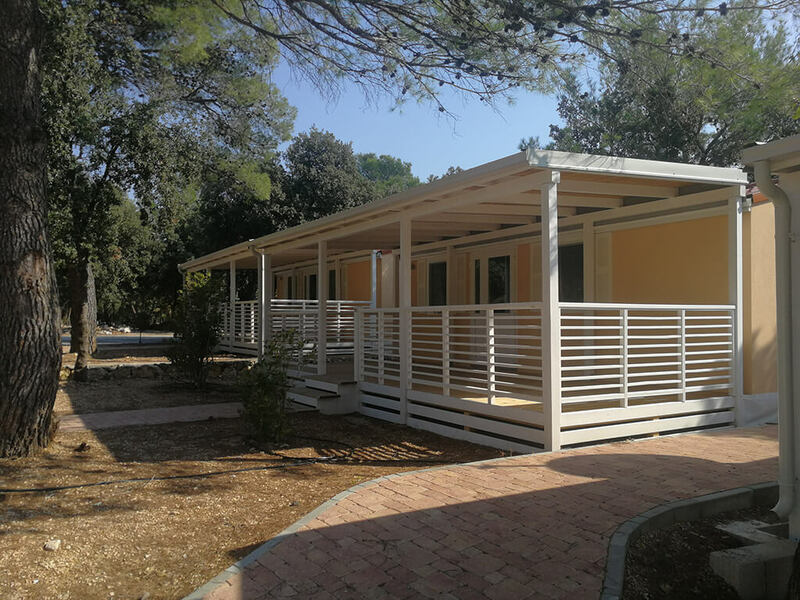 By purchasing a token at reception, you can use laundry washing and drying machines which are near to the Tavolara mobile homes. 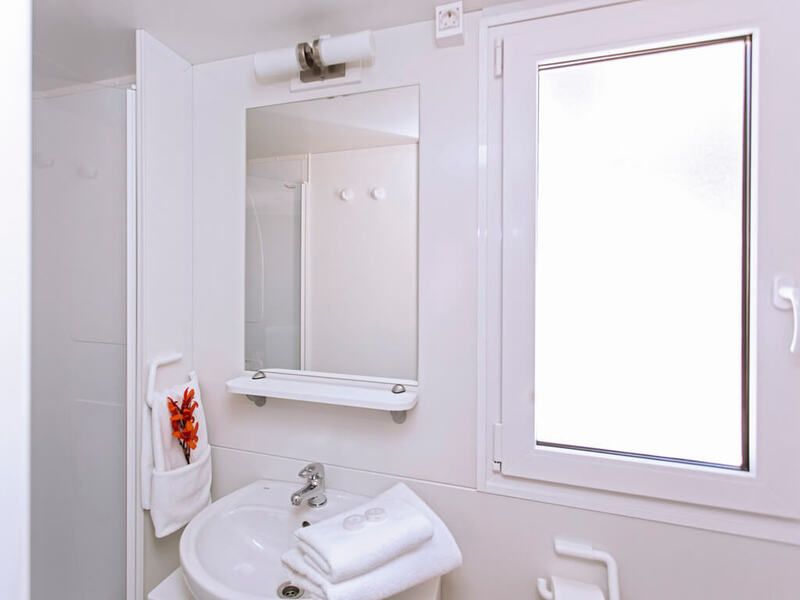 The campsite Park Soline sanitary points are equipped with showers and wash basins with hot water, baby changing areas, areas for hand washing of laundry and dishes, bathrooms adapted for disabled persons and showers for pets. Inside the campsite Park Soline there isn't a swimming pool. 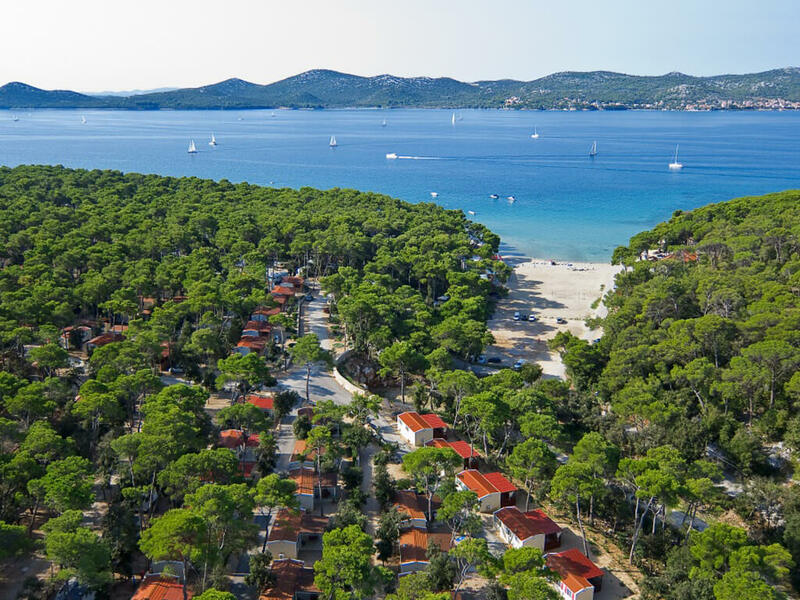 Campsite Park Soline is situated right by the sea. 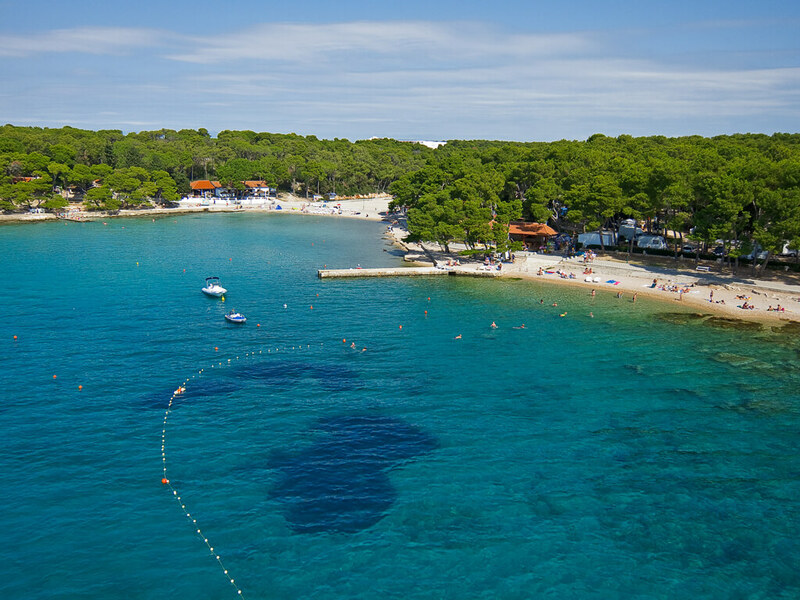 With its entire length, it is surrounded by a pebble beach. In the vicinity of the campsite there is a sandy beach Soline. 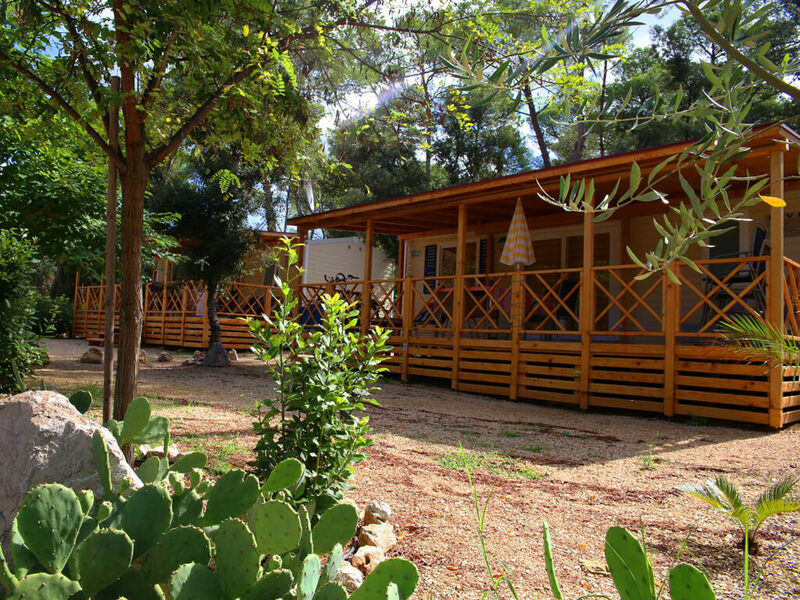 The beach adapted for pets is located 300 m from the main campsite beach. 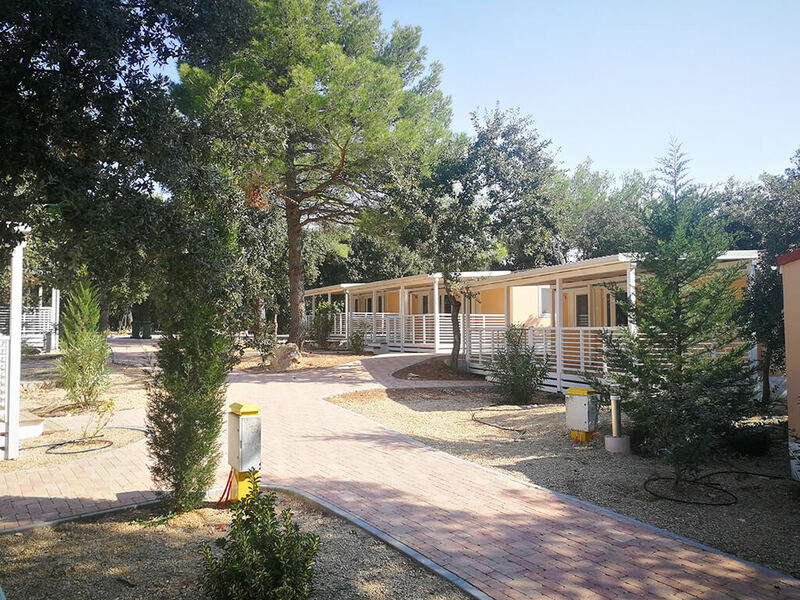 Campsite Park Soline is a textile campsite and does not have a naturist beach. 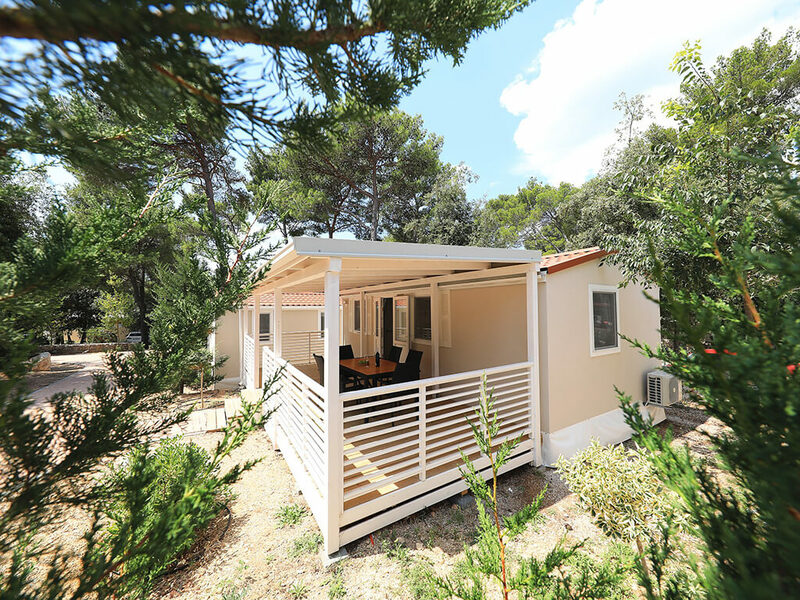 What are the prices of sunbed and sunshade rental at the campsite? 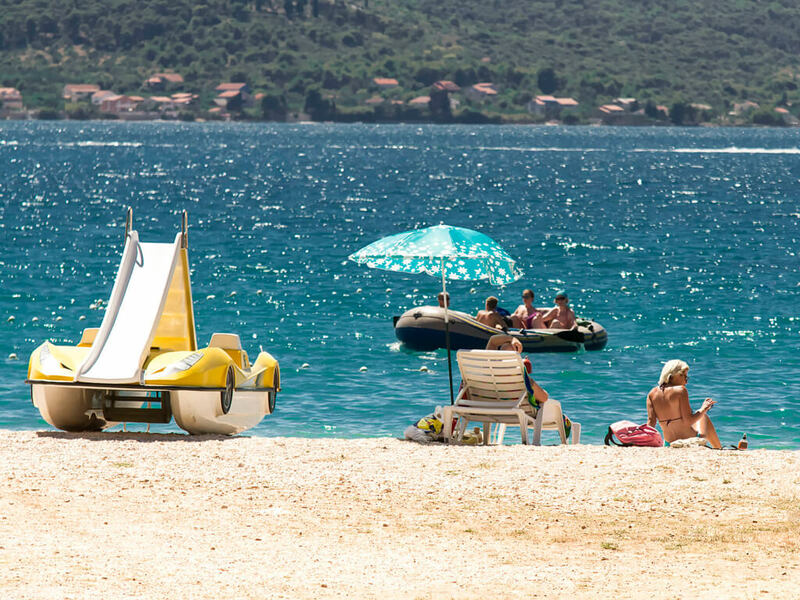 Guests at the beach at their disposal have sunbeds with an additional cost of 30 kn per day. 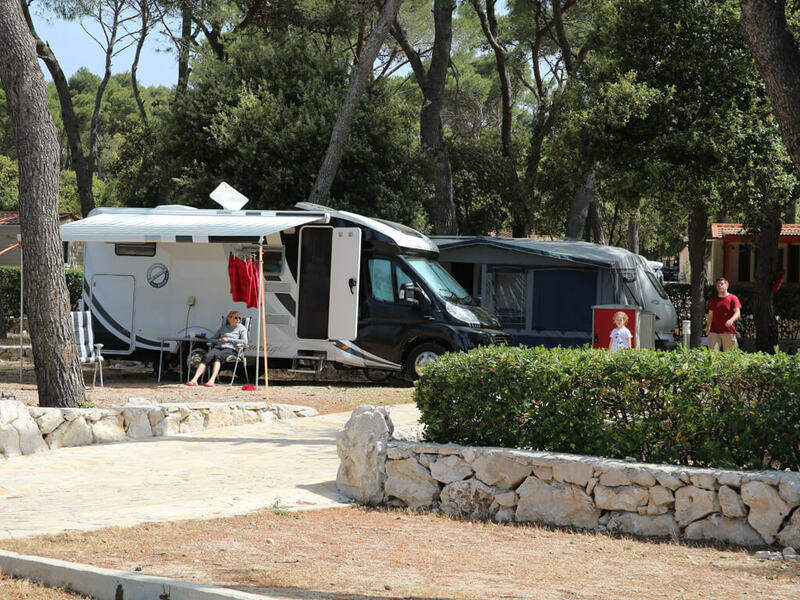 Campsite Park Soline doesn’t have a marina. 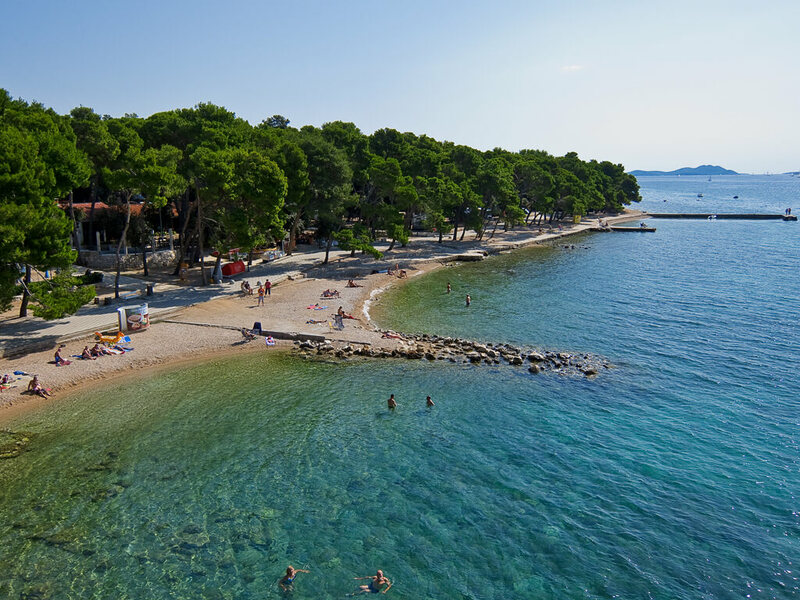 A marina is situated in city of Biograd which is 2 km away from the campsite. 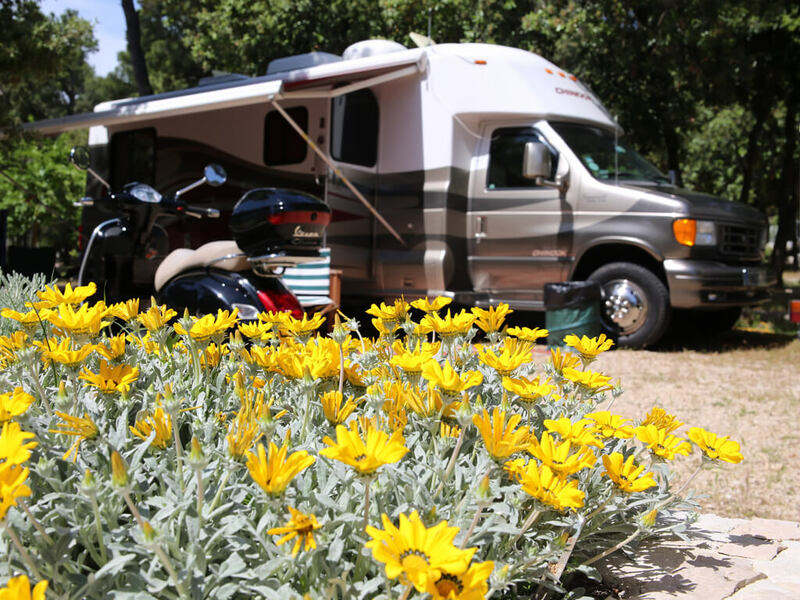 Is there a period reserved for peace at the campsite, when entrance and exit are not permitted? 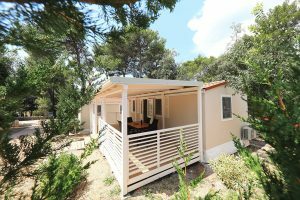 The period of peace at campsite Park Soline is between 10 p.m. and 7 a.m.
Barbecuing, using electric barbecue is allowed at the campsite. Open fires are strictly forbidden. 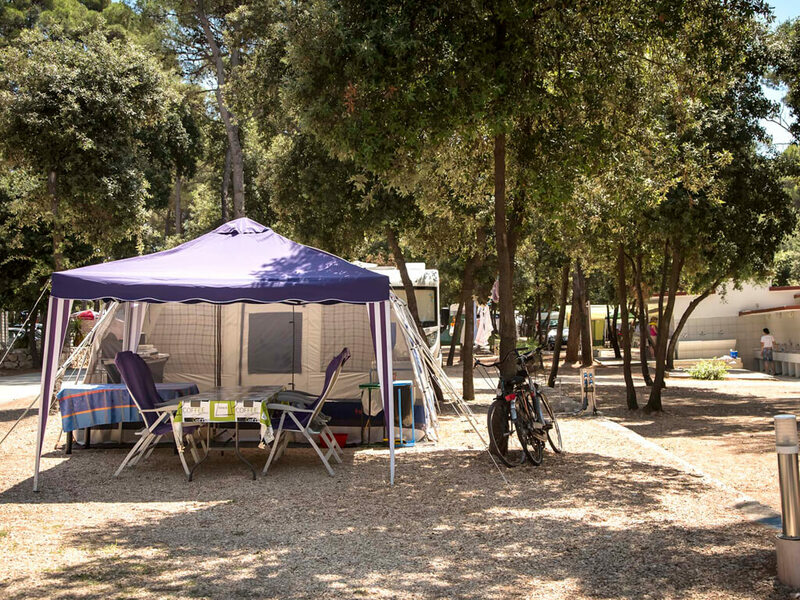 At campsite Park Soline there are designated BBQ areas, situated in the vicinity of the sanitary point no. 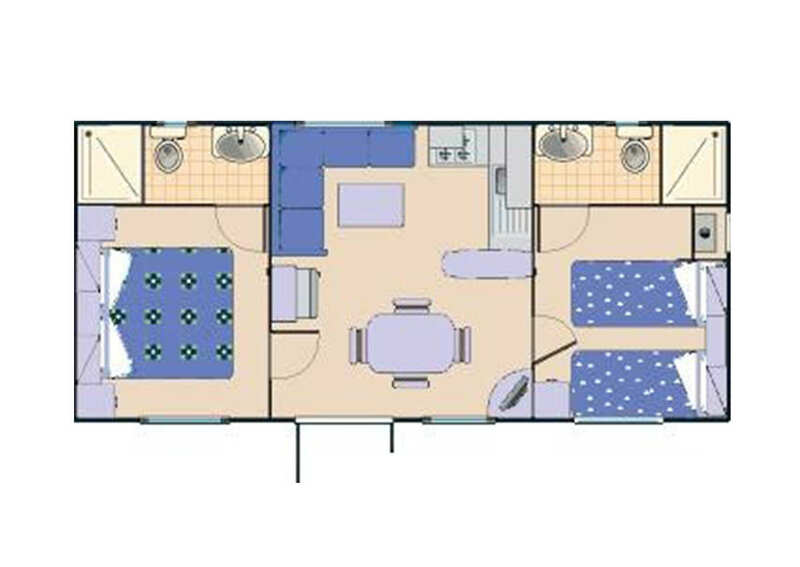 2 and in the zone of Comfort Family mobile homes. We haven't arrived on time to the campsite. 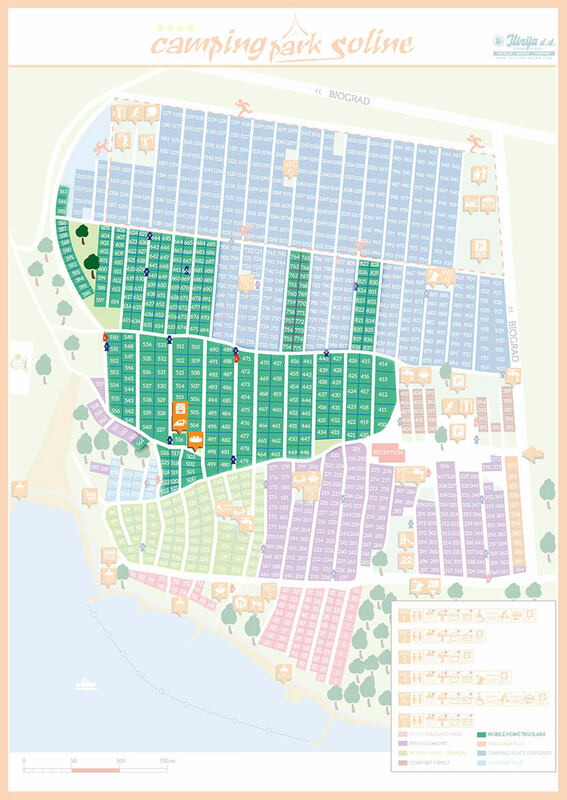 Is entrance to the campsite by car allowed during the night? 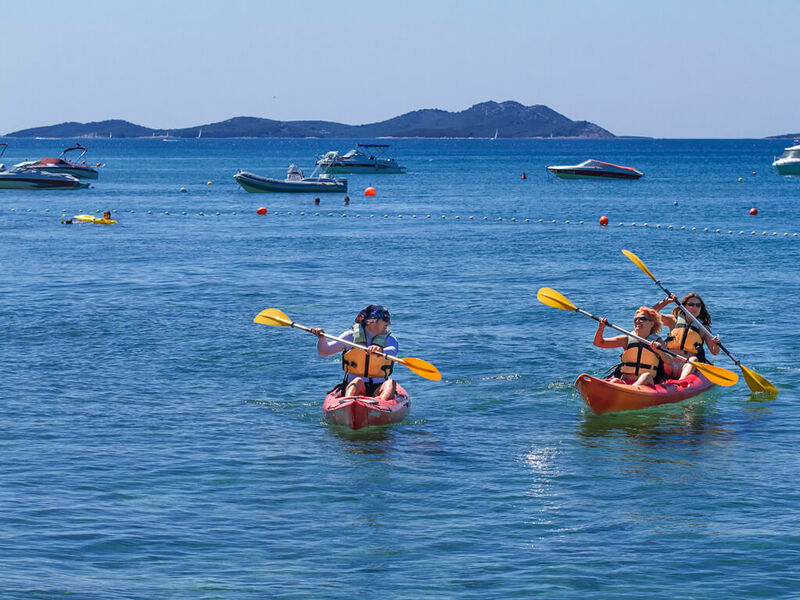 Arrival by car at the campsite is not allowed from 10 p.m. until 7 a.m.
Is there a connection with the centre of the town of Biograd? 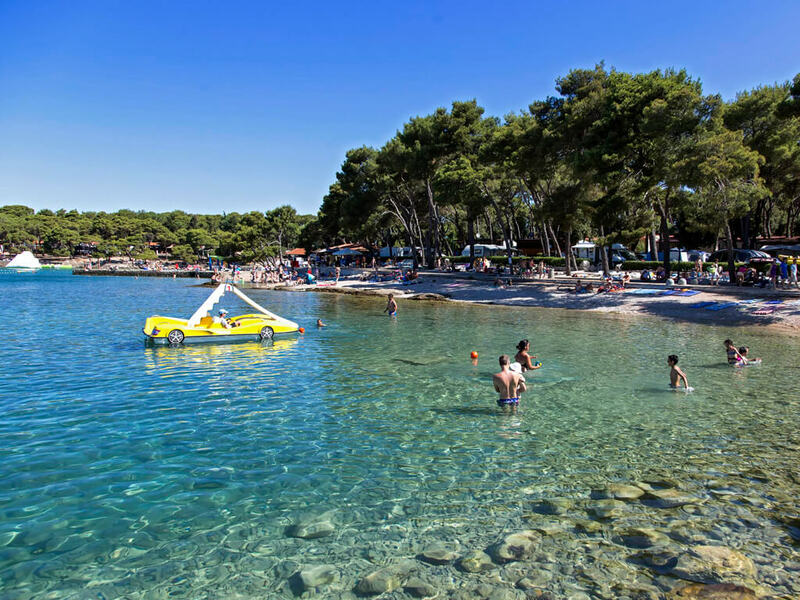 Campsite Park Soline is 2 km away from Biograd, you can reach the town centre by the promenade along the sea. 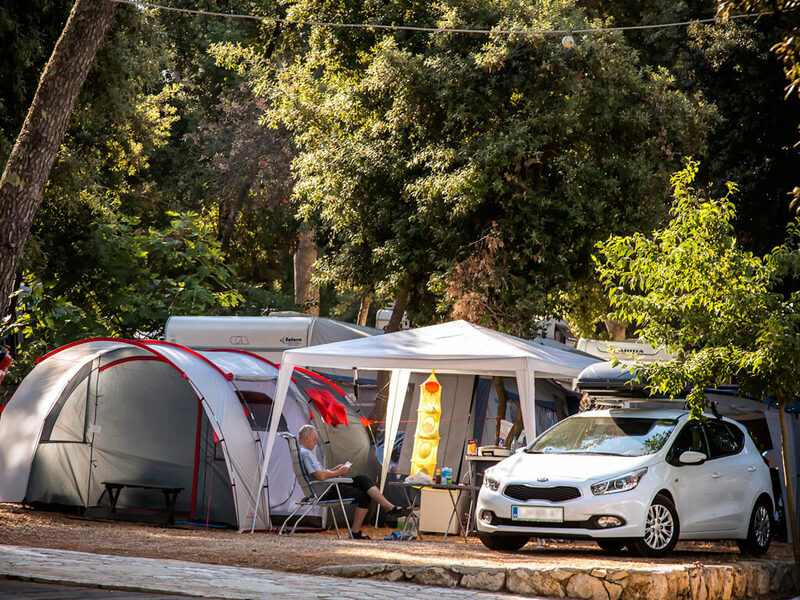 What are the campsite Park Soline GPS coordinates? 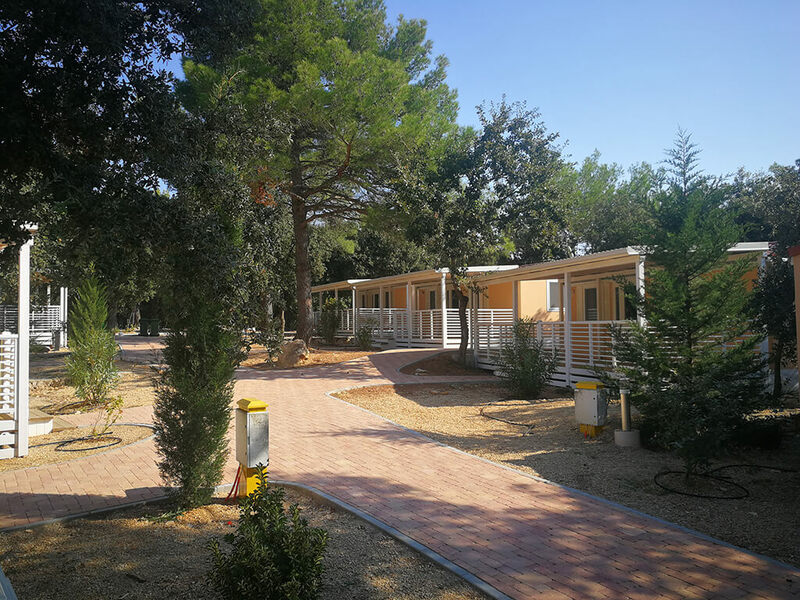 The campsite Park Soline GPS coordinates are 43° 55` 39" and 15° 27` 21". 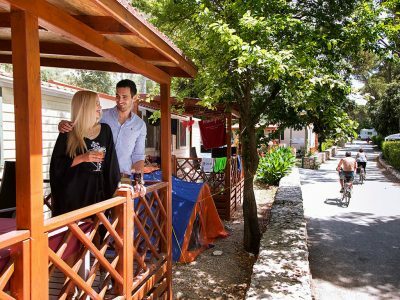 Campsite Bluesun Paklenica – a campsite which is perfect for an active holiday in nature. 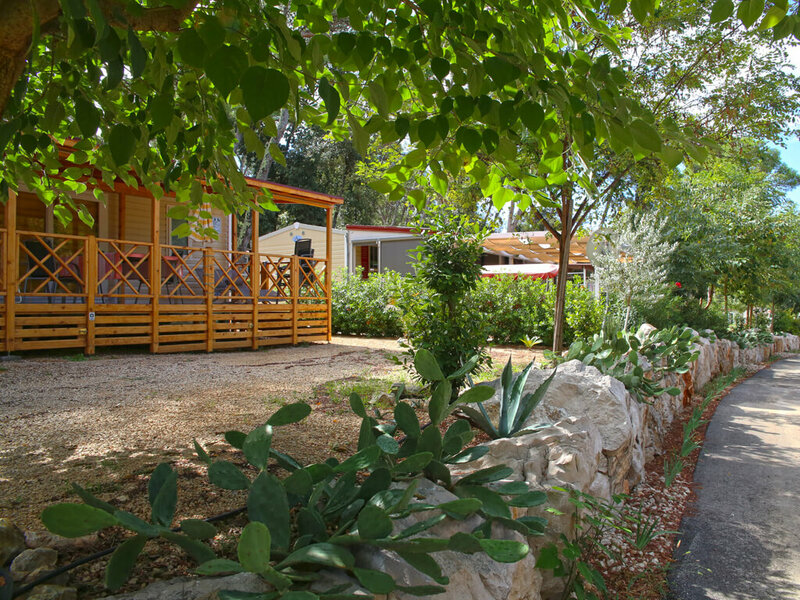 Near Novalja, nestles Campsite Straško, a campsite which abounds in a multitude of facilities for an active holiday.